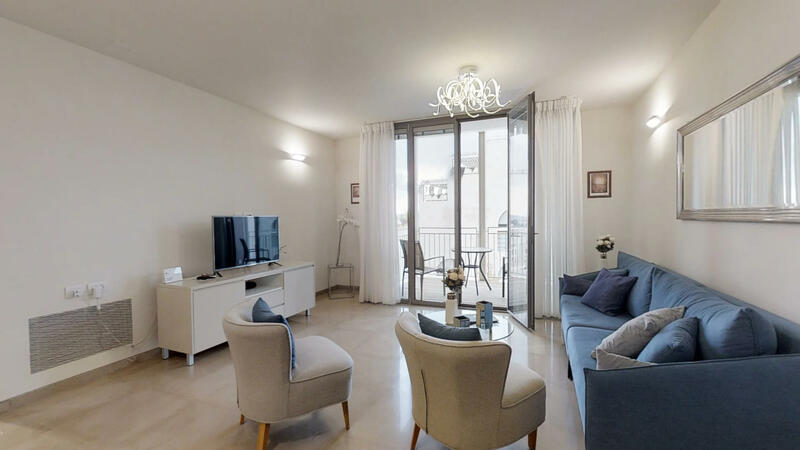 [MAMILA 14 - 811] : Located in the new magnificent Mamilla complex, just above the new shopping center and across the street from the David Citadel Hotel, this apartment boast of being in the most luxurious neighborhood of Jerusalem! 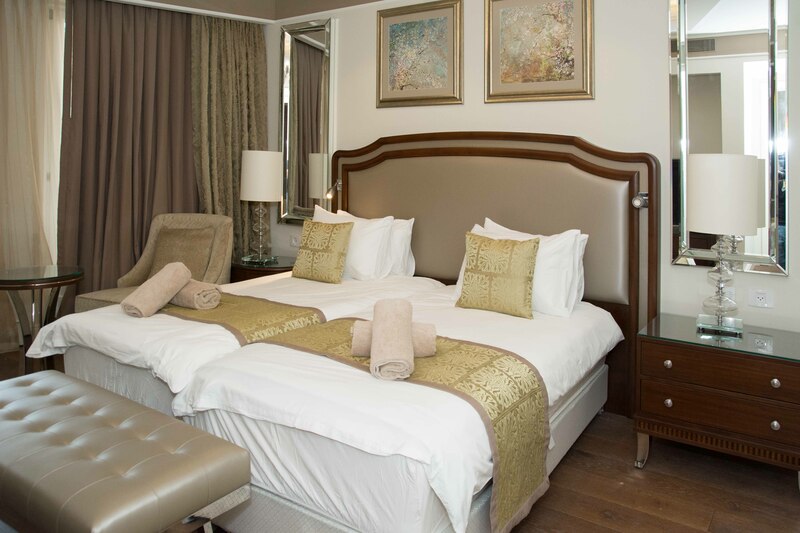 [WALDORF ASTORIA-C2, THE PA] : For those who appreciate total luxury in an atmosphere of calm and tranquility, the Waldorf Astoria residence Suites offers the perfect retreat right in the heart of Jerusalem within walking distance to the old city. 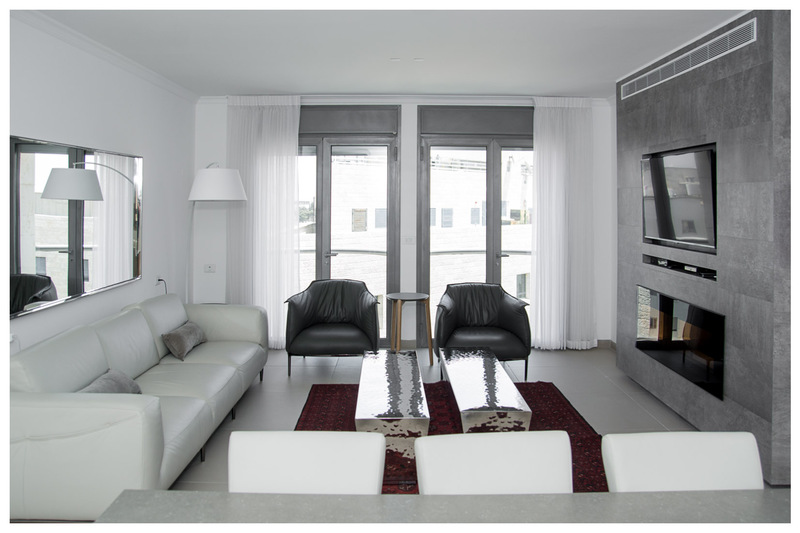 The suites feature features a decorative living area, fully equipped and kosher kitchens. lavish marble bathrooms with shower, bathtub and guest powder room. 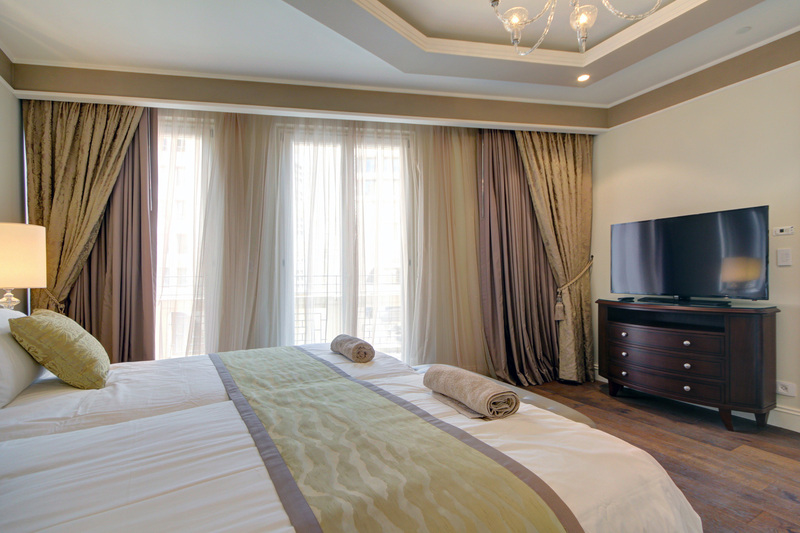 52-inch LED televisions in the bedrooms and living room, free Wi-Fi, balconies. The luxurious furnishings create the grandeur and intimacy of a Waldorf Astoria apartment. 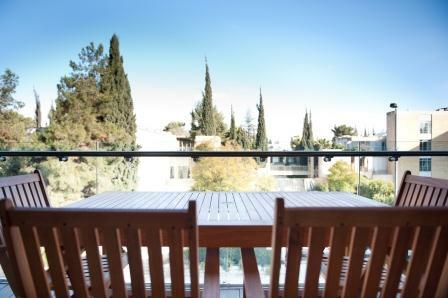 [YSMACH MELECH 37] : In the heart of the David’s village secured neighborhood, facing the magnificent Mamila complex and adjacent to the David Citadel Hotel,an upscale penthouse is offered for a unique vacation near the Old City! 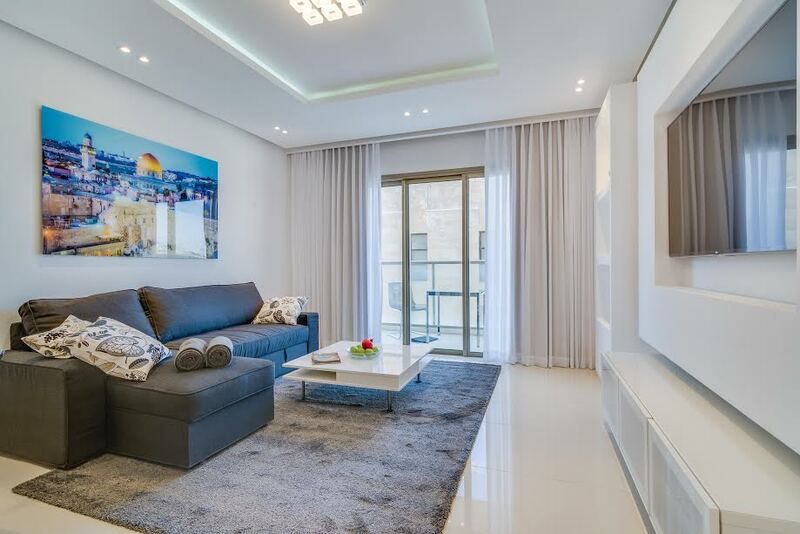 [mamila 16 DL] : Located in the new magnificent Mamilla complex, just above the new shopping center and across the street from the David Citadel Hotel, this apartment boast of being in the most luxurious neighborhood of Jerusalem! Situated on the 3rd floor with elevator, with 2 bedrooms and 2 baths, this stunning vacation apartment has it all! It offers 100sqm of fabulous living area, bright and comfort! 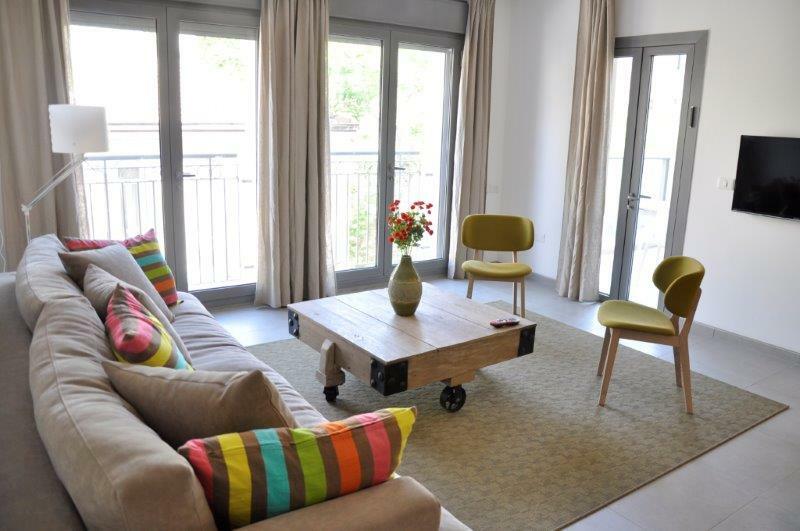 Spacious living-room with exit onto a lovely balcony facing the spectacular view of the Old city! Equipped & modern kosher kitchen including all appliances and dining area. Beautifully designed and tastefully furnished to the higest standard. Includes: Fresh linens & towels, washer/dryer, dishes and cooking utensils, Free Wifi and tv. Similar to a 5 star hotel room, the master bedroom has one King size comfortable bed, a WALL TO WALL closet and an en-suite bathroom with bathtub & toilet. The 2nd bedroom offers a big closet and a large queen bed that can be separated into 2 twin beds. Additional bathroom with shower and toilet in the hall. Air conditioning and heating,completely soundproof. Shabbat clock and all other amenities for Shabbat /Chagim. Secured neighborhood, private underground parking with direct acess to the apartment! The location: 5 min walk to the old city and 10 m to the Kotel, 5 min walk to the city center 2-8 min walk to famous hotels as the King David, the Citadel, the mamilla hotel as well as the Inbal. The apartment will be clean and ready for your arrival and our managment will do everything possible to ensure that your stay is enjoyable and unforgettable! Don't hesitate and book it today! There is optional parking 3min walk from the building. 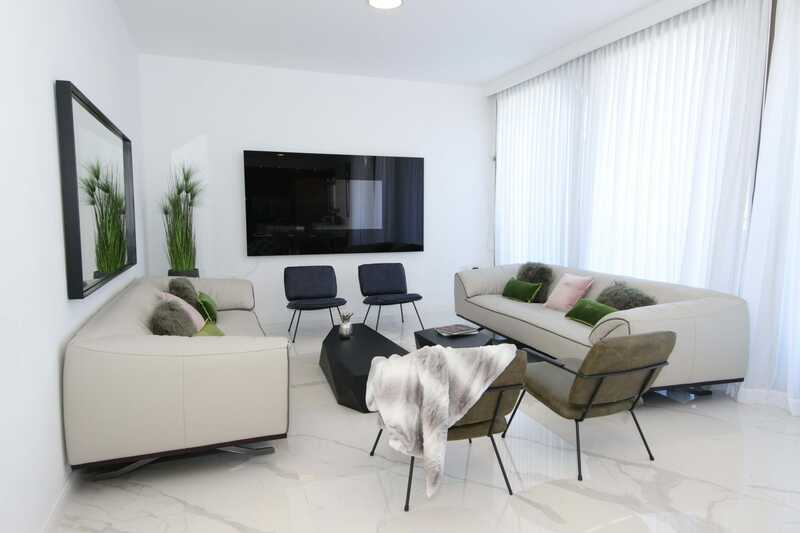 [A11] : Located in the famous brand new luxurious building of the Rav Kook. In the most central location in Jerusalem, near all restaurants, Ben yeuda avenue and a short walk to the mamilla and the old city! 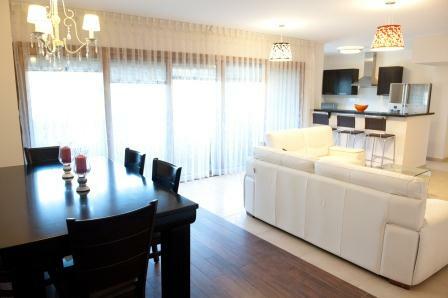 Magnificent and spacious 2- bedroom apartment fully furnished and equipped, beautifully designed into high standard! The apartment has everything you need for a prefect vacation. At the luxury lobby downstairs, you will find beautiful patios and fountains, a security 24/7, a gym that is open for the residents of the building and a private underground parking space.Book this vacation today! [B34 Kook 7] : Located in the famous brand new luxurious building of the Rav Kook./n In the most central location in Jerusalem, near all restaurants, Ben yeuda avenue and a short walk to the mamilla and the old city!/n Magnificent and spacious 3- bedroom apartment fully furnished and equipped, beautifully designed into high standard! The apartment has everything you need for a prefect vacation./n At the luxury lobby downstairs, you will find beautiful patios and fountains, a security 24/7, a gym that is open for the residents of the building and a private underground parking space./n Book this vacation today! 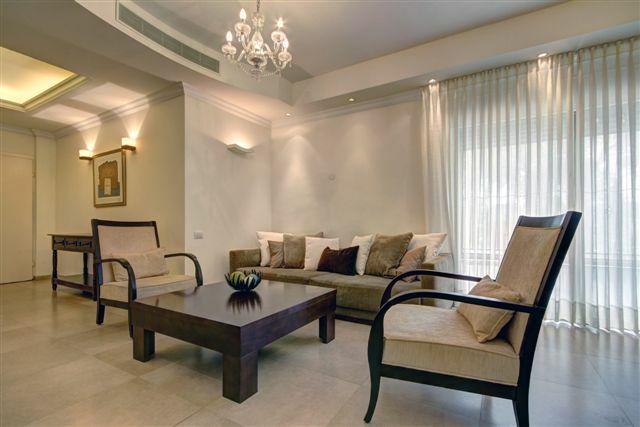 [KDR 304] : Brand new, beautifully designed 4-room apartment in the King David Residence building! Fully furnished and equipped on the 3rd floor with shabbat elevator. 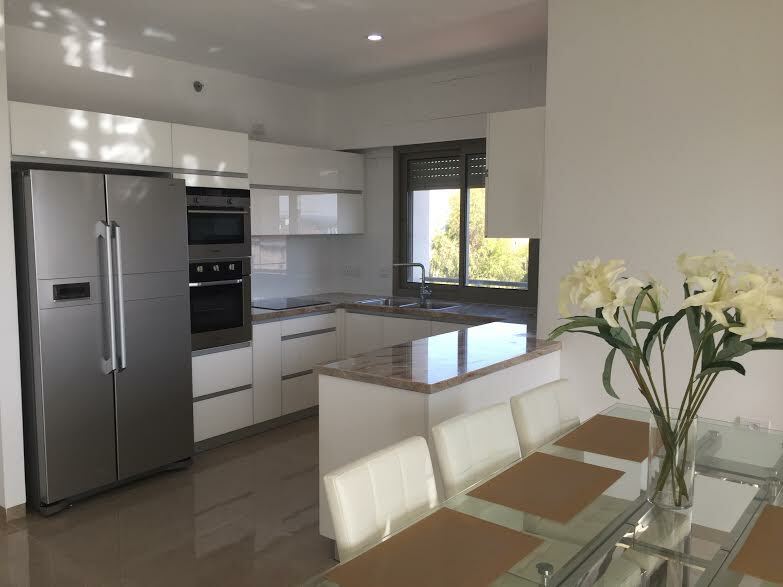 3 comfortable bedrooms, 2 full bathrooms, bright and spacious living room and dining area, exit onto a terrace , additional sukkah terrace from the bedroom, equipped & kosher kitchen with all appliances. WIFI AND TV, washer and dryer, linens and towels. Secured building with doorman and 24/7 reception, magnificent lobby, indoor swimming pool and gym, synagogue, cigar room & wine cellar. Gorgeous apartment magnificently located , within walking distance to the Mamilla mall and the Old city as well as to the city center. [HARAV KOOK 7 - C6] : Located in the famous brand new luxurious building of the Rav Kook./n In the most central location in Jerusalem, near all restaurants, Ben yeuda avenue and a short walk to the mamilla and the old city!/n Magnificent and spacious 2- bedroom apartment fully furnished and equipped, beautifully designed into high standard! The apartment has everything you need for a prefect vacation./n At the luxury lobby downstairs, you will find beautiful patios and fountains, a security 24/7, a gym that is open for the residents of the building and a private underground parking space./n Book this vacation today! 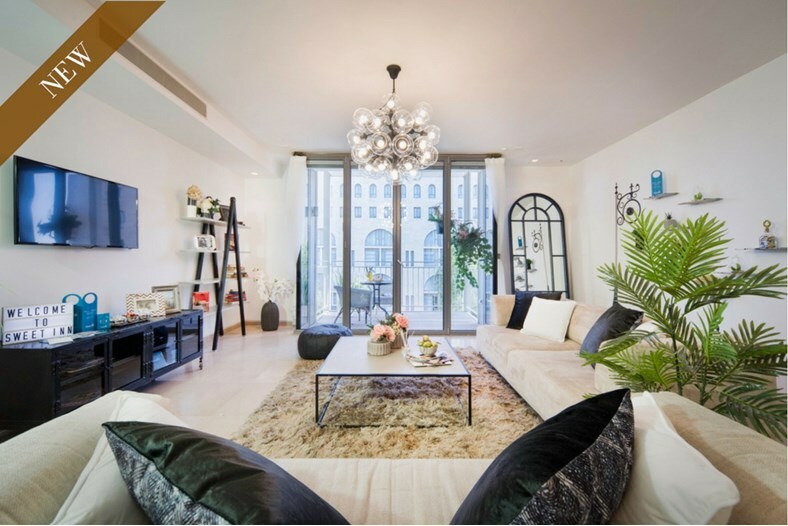 [HaRav Kook 7 A8] : This charming and beautiful apartment is located in the luxurious and well located 7 kook street brand new building in the heart of the city center! Walking distance to mamilla (6mns walk), the old city (10mns) and the city center and geula (1 mn). Lovely and spacious 3 bedrooms, 2 baths on the 6th floor with shabbat elevator. Fully furnished and equipped, Comfortable beds, can accommodate 6, modern and kosher kitchen with all utensils and dishes. Light and airy living room and dining area with exit onto a balcony facing an amazing view of the city of Jerusalem. Private parking space, TV and wifi, towels and linens. We invite you to come and spend a beautiful & relaxing stay in the most desired area of Jerusalem. Book this apartment today! Price depends on length of stay and season! [KDR 403] : On the 3rd floor with elevator, luxury and designed 5-room apartment, 145sqm, includes 4 bedrooms and 2 balconies. 1 double bed in each bedroom, master bedroom with shower, and separated bathroom with additional shower and toilet. High standard finishes, furniture and appliances with washer and dryer, WIFI and TV and more. 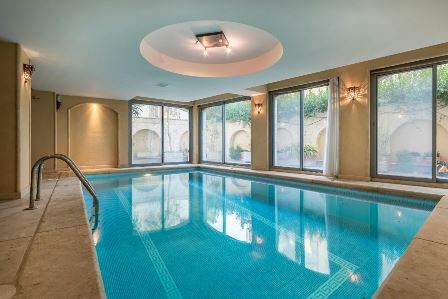 Fabulous lobby, synagogue, indoor swimming pool, security 24h/7, fiteness center and private parking. 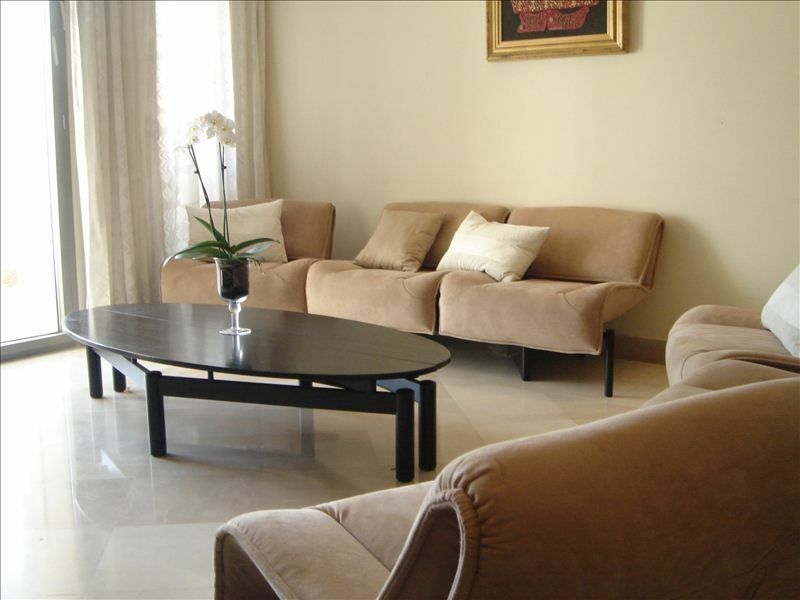 Enjoy a magnificent vacation rental in the heart of the luxury Talbieh neighborhhod! 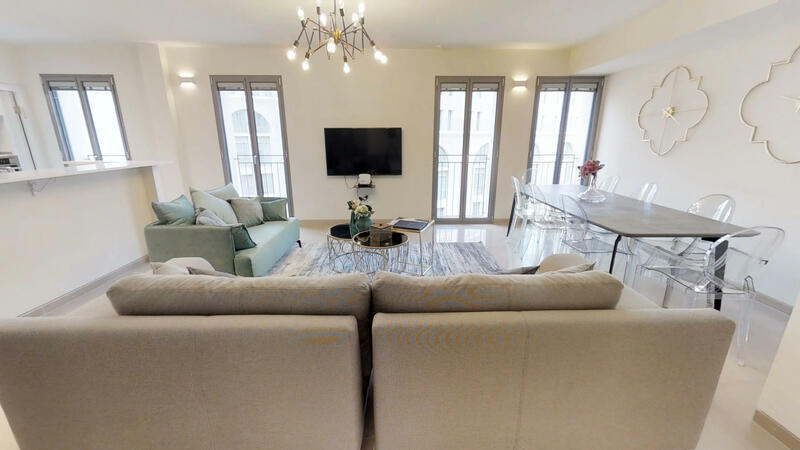 [HaRav Kook 7 A12] : This charming and beautiful apartment is located in the luxurious and well located 7 kook street brand new building in the heart of the city center! Walking distance to mamilla (6mns walk), the old city (10mns) and the city center and geula (1 mn). Lovely and spacious 3 bedrooms, 1 bath on the 1st floor with shabbat elevator. Fully furnished and equipped, Comfortable beds, can accommodate 6, modern and kosher kitchen with all utensils and dishes. Light and airy living room and dining area. Private parking space, TV and wifi, towels and linens. We invite you to come and spend a beautiful & relaxing stay in the most desired area of Jerusalem. Book this apartment today! Price depends on length of stay and season! 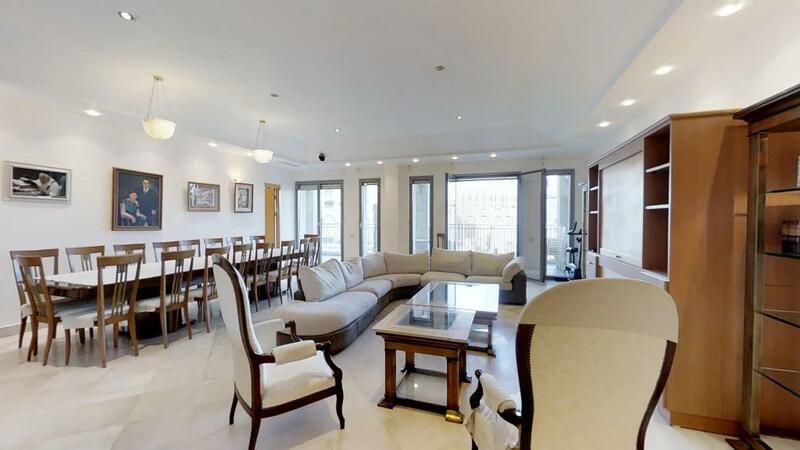 [HaRav Kook 7 A4] : Located in the famous brand new luxurious building of the Rav Kook. Magnificent and spacious 2- bedroom, 1 bathroom. 67 sqm. 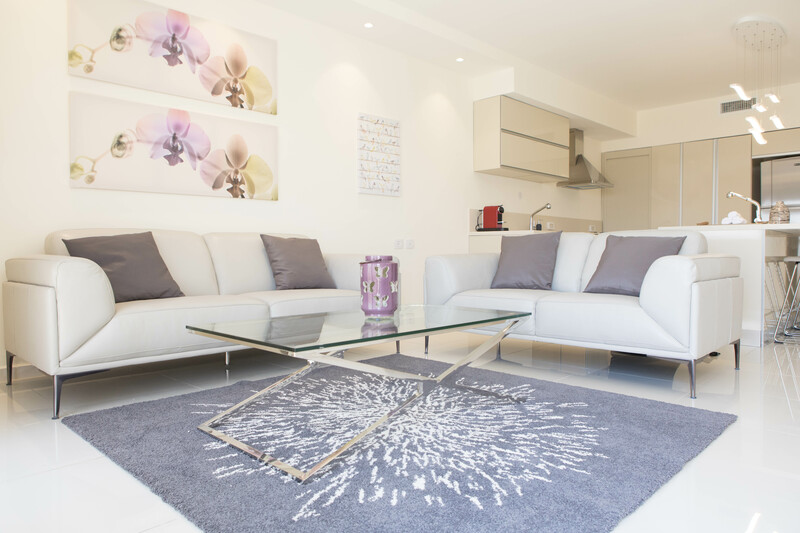 apartment fully furnished and equipped, beautifully designed into high standard! The apartment has everything you need for a perfect vacation. 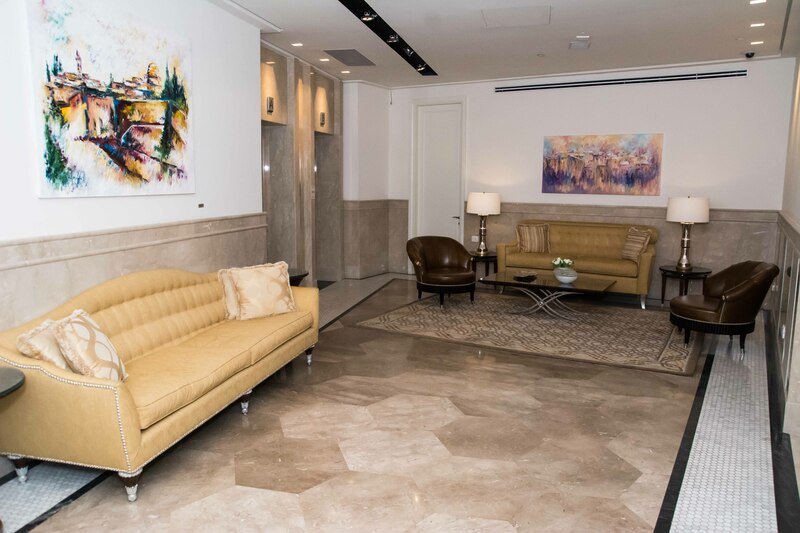 At the luxury lobby downstairs, you will find beautiful patios and fountains, a security 24/7, a gym that is open for the residents of the building and a private underground parking space. [KDR 306] : Luxurious and designed 5- room apartment of 145sqm on the 4th floor with shabbat elevator and private parking. The premise offers 4 bedrooms, 2 bathrooms and 2 balconies. 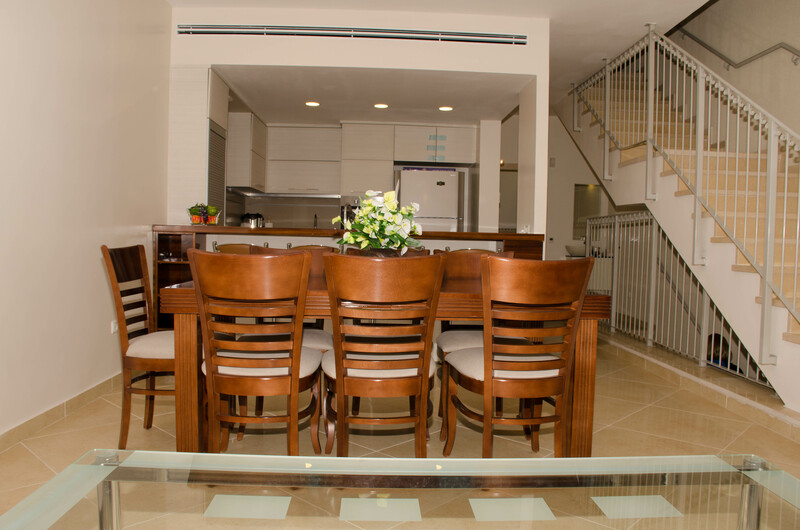 Fully furnished and equipped, kosher kitchen with all appliances, lovely and comfort living room and dining area. Comfortable and modern bedrooms, fresh linens and towels, master bedroom with shower, additional bathroom with shower and toilet. High standard finishes, washer and dryer, FREE WIFI , TV and more. Book today this vacation rental in the heart of Jerusalem within short walking distance to Mamila, the big hotels and the old city. Location Location Location... and all the amenities. Kosher kitchen,Indoor pool, gym, sauna, 24 hour security, private indoor parking,luxurious lobby, conference room, beautiful courtyard, Synagogue. [A21 Rav Kook] : Four bedrooms, three full bathrooms and totally renovated. The apt comes fully furnished and equipped, all the new Appliances and all new furniture. Central AC for cooling and heating plus private heating. Sukkah balcony and great directions. [KDR 302] : The apartment is in the King David Street No. 16. 1-minute walk from the famous Mamilla center, 6 minutes from Ben Yehuda and seven minutes from downtown. The facility is the prestigious "King David Residence".And it is in front of the David Citadelle ! The apartment is on the 2nd floor. 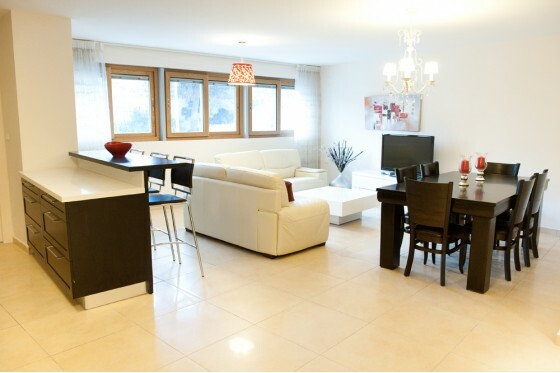 130m2, 3 bedrooms (king size), 2 bathrooms, 2 large terraces with the most beautifull terace of the King David Residence !. We are at your service throughout your stay. [HARAV KOOK 7 - C9] : The apartment is in the Harav Kook Street No. 7. The facility is the prestigious "Rav Kook Residence"! The apartment is on the 2nd floor. 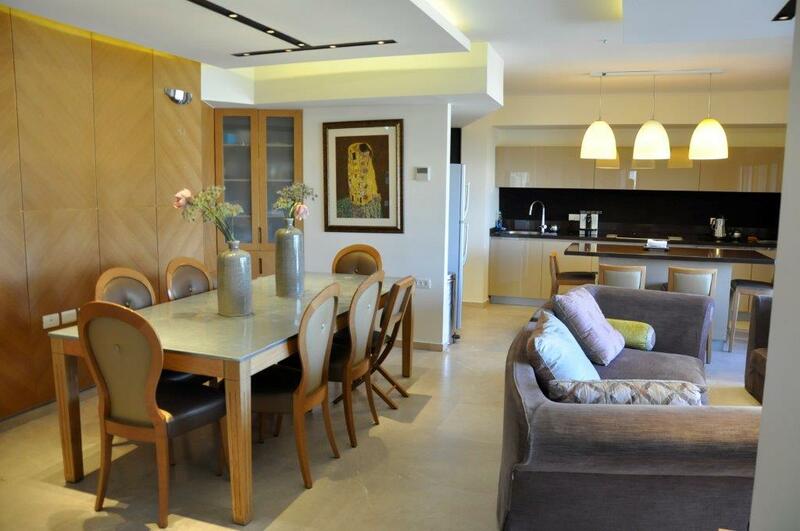 130ms, 3 bedrooms (king size) 9 sleeps, 3 bathrooms, 2 large terraces. 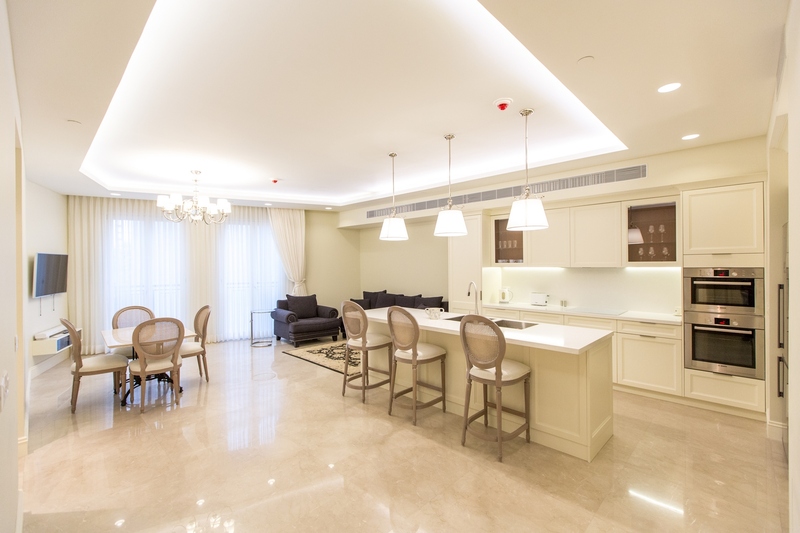 [7 KOOK ST C30] : Located in the famous brand new luxurious building of the Rav Kook. In the most central location in Jerusalem, near all restaurants, Ben yeuda avenue and a short walk to the mamilla and the old city! Magnificent and spacious 4- bedroom apartment fully furnished and equipped with an amazing view, beautifully designed into high standard! The apartment has everything you need for a prefect vacation. At the luxury lobby downstairs, you will find beautiful patios and fountains, a security 24/7, a gym that is open for the residents of the building and a private underground parking space. Book this vacation today! 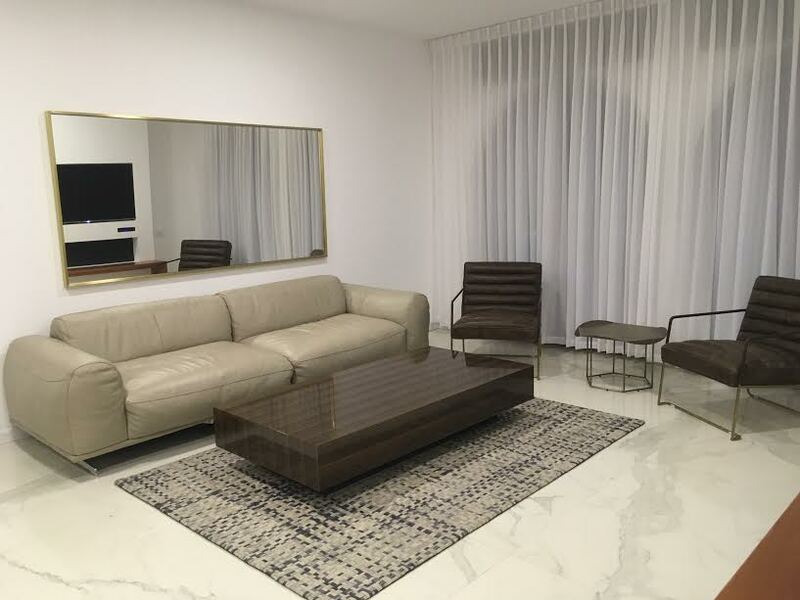 [King David Residence 110#] : Brand new Luxury 3 bedroom apartment fully furnished and equipped in the magnificent King David residence building. 4th floor with elevator the apartment offers 125sqm spacious living space. Master bedroom with shower room, 2 bedroom each with 2 single comfortable beds,1 full bathroom and additional toilet guest, equipped and kosher kitchen, lovely living room with exit into a peaceful terrace facing the garden and view! Apartment has all facilities and was specially designed for a perfect vacation rental! For use of the building's residents only: Gorgeous lobby, 24/7 doorman, indoor swimming pool, sauna and jacuzzi, gym, cigar room, synagogue and private parking. We invite you to enjoy the beauty of this apartment together with amenities and comfort similar to a hotel and of course an amazing and perfect location near the Old City! 2 bedrooms (2 double beds), 2 bathrooms with bathtub and WC, living room, kitchen, air conditioning, swimming pool and terrace (45m2 ),furniture possibility of parking and private building. 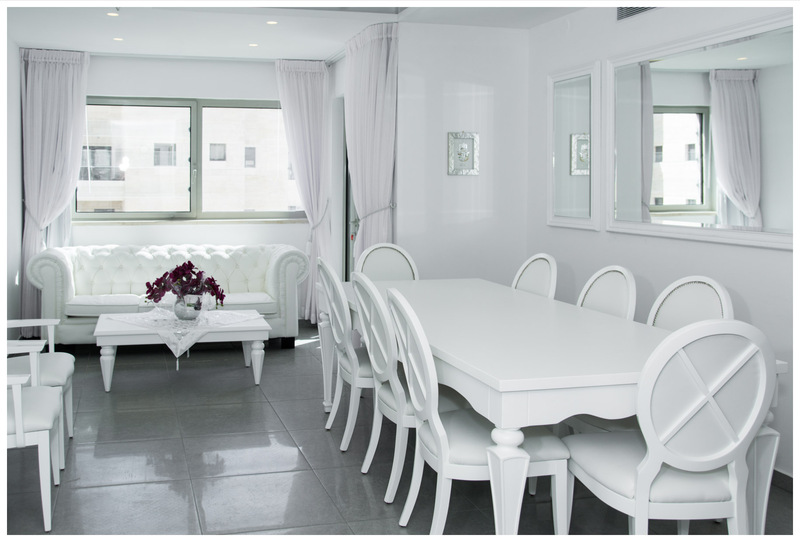 [SAIDOFF TRIPLEX 102] : Your choice of vacation rental apartments in the city center of Jerusalem! In addition to the building's historic preserve, this ground floor 4 bedroom apartment on 3 levels features a private succah patio. 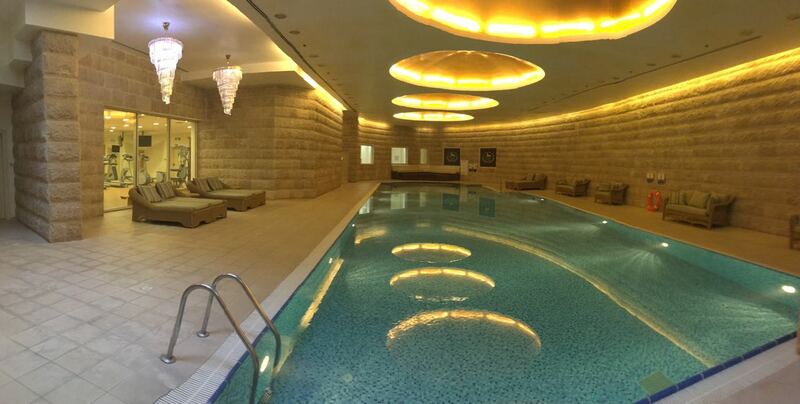 It is located in a luxury complex right next to The Shuk on Yaffo street which provides a gym, pool, and spa free of charge as well as underground parking! Adjust the central air conditioning and heating to make yourself comfortable. The apartment is well-suited for families, as there is ample entertainment and cooking facilities. A crib can be provided upon request. For guests who keep kosher, the kitchen includes a double sink, ideal for meat and dairy. The building faces the new Jerusalem tram, for easy access to public transportation. It also has a large courtyard and exhibits exemplary architecture. The location is everything! You are right in the city center on Yaffo street which is home to some of the best local shopping in Jerusalem. In only 14 minutes, you can walk to Ben Yehuda pedestrian mall. Just 4 minutes from residence is the Shuk. Mamilla mall is a straight 23 minute stroll along Yaffo. There you'll find some of Jerusalem's most savory restaurants and cafes. Mamilla street is adjacent Jaffa Gate, your key to the Old City. Enter a prayer at the Western Wall or wind through the ancient alleyways of the ancestors. The Himalaya will carry your holiday hopes to new heights! 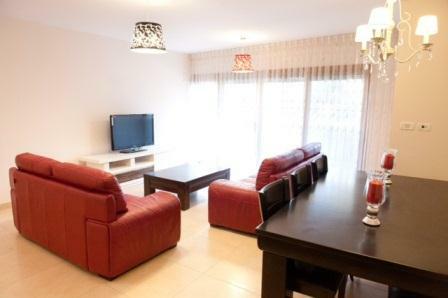 This is a 4 bedroom vacation rental apartment with 3 bathrooms located in the city center. It includes: central air conditioning, heating, bathtub, washer/dryer, internet wifi, gym, DVD player, linens/towels, kosher kitchen, iron/board, spa, lobby, parking, and a succah patio. Relax in this brand new bright 1 bedroom, 1 bath vacation rental - 2 guests in a new building on Haneviim street gorgeous balcony facing an unrivaled view to the old city ! security and reception. Relax in this brand new bright 2 bedroom, 2 bath vacation rental - 5 guests in a new building on Haneviim street gorgeous balcony facing an unrivaled view to the old city ! security and reception. 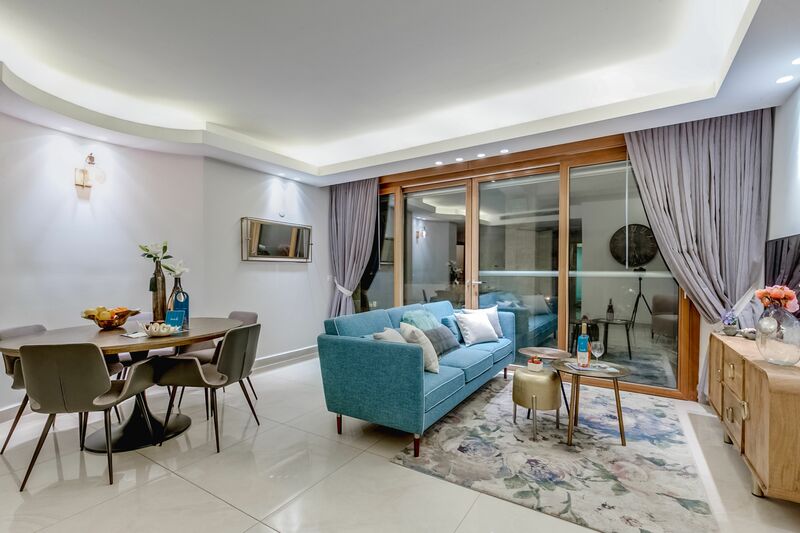 [HaRav kook A5] : This modern and comfort apartment is located in the luxurious and well located 7 kook street brand new building in the heart of the city center! Walking distance to mamilla (6mns walk), the old city (10mns) and the city center and geula (1 mn). Lovely and spacious 3 bedrooms, 2.5 baths on the lobby floor with shabbat elevator. Fully furnished and equipped, master and 2 twin beds, can accommodate 6, modern and kosher kitchen with all utensils and dishes. Light and airy living room and dining area with exit onto tow balconies Private parking space, TV and wifi, towels and linens. We invite you to come and spend a beautiful & relaxing stay in the most desired area of Jerusalem. Book this apartment today! Price depends on length of stay and season! [KDR 113] : On the 4th floor with elevator, luxury and designed 4-room apartment, 100sqm, includes 2 bedrooms and a balcony. 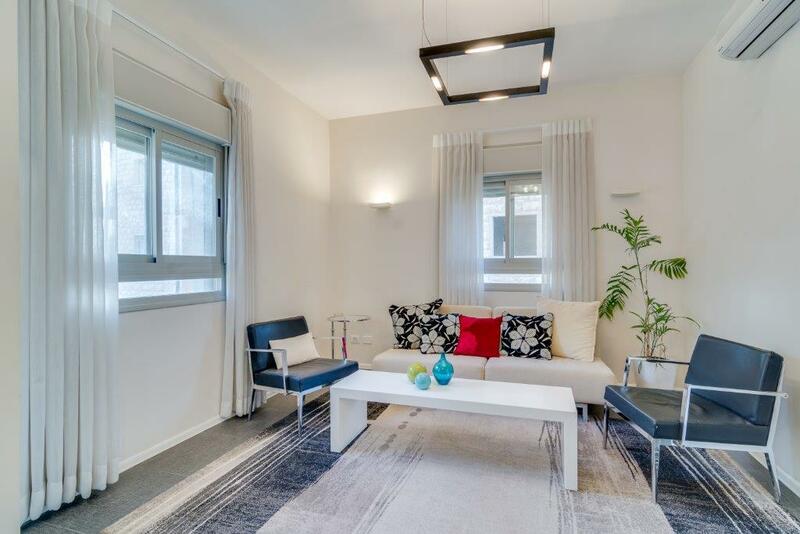 [Ben shetah Duplex] : Located in a superb location near restaurants, pabs, coffeshops, 1 minute from the Mamilla mall, the city center and the old city. [Mamilla 16 RP] : Enjoy luxury accommodations for 4 and pay less than 1 hotel suite! Situated on the 4rd floor with Shabbat elevator, with 2 bedrooms and 2 baths, this stunning vacation apartment has it all! It offers 100sqm of fabulous living area, bright and comfort! Spacious living-room . Equipped & modern kosher kitchen including all appliances, dishes and dining area. You will get: Fresh linens & towels, washer/dryer, dishes and cooking utensils, free WiFi and TV. [WALDORF ASTORIA B] : The Waldorf Astoria is a social icon of elegance and distinction. There our special guests can enjoy the impeccable service, personal attention and luxurious spaces. This apartments is located in the Waldorf Astoria Residences, next to the Hotel, have been carefully designed, and they have modern and exclusive elevators that ensure your privacy. They also have balconies where you can delight yourself with the beautiful Jerusalem Old City view. Located at the best spot in the city, surrounded by the best cultural and artistic attractions such as the Alrov Mamilla Avenue, the Old City, art galleries and the YMCA, this area is the most beautiful one to spend your days in town. So offer yourself a little treat in this luxury rental and you will never forget your stay in Jerusalem. 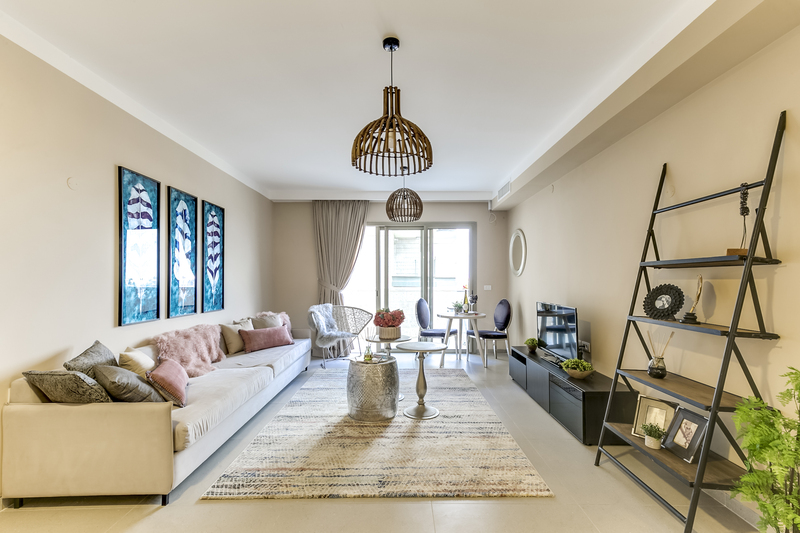 [KING DAVID RESIDENCE - 107] : You can enjoy the pleasure to be in a beautiful apartment located in downtown area and 15 minutes by foot to the Kotel. 4 bedrooms (4 single beds + 1 double bed + 1 queen size bed), 2 bathrooms, living room, dining room, kitchen, A/C, 1 balcony. [KING DAVID RESIDENCE-104] : 3 bedrooms (2 single beds + 1 double bed + 1 queen size bed), 2 bathrooms, living room, dining room, kitchen, A/C, all furnished. [KING DAVID RESIDENCE-108] : 2 bedrooms (2 double beds), 2 bathrooms, living room, dining room, kitchen, A/C, 1 balcony, all furnished. 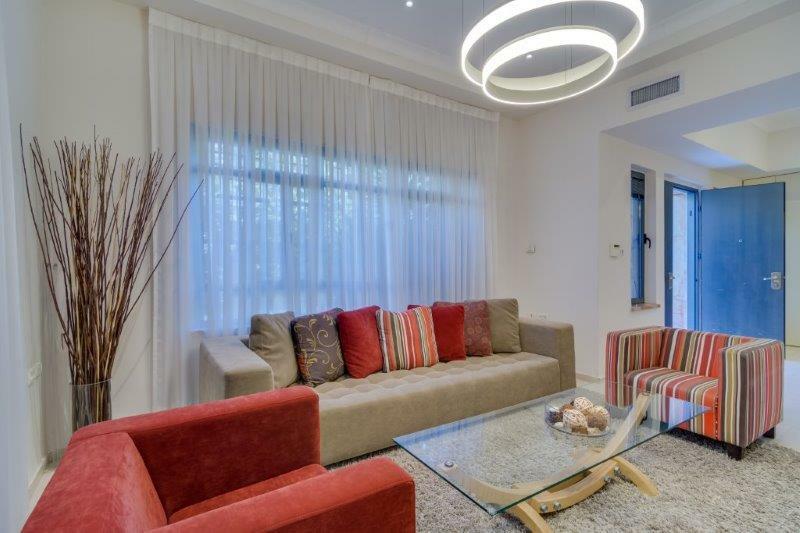 [KING DAVID RESIDENCE-202] : Beautiful apartment in King David Résidence 3 bedrooms (4 single beds + 1 queen size bed), 2 bathrooms, living room, dining room, kitchen, A/C, 1 balcony, all furnished. 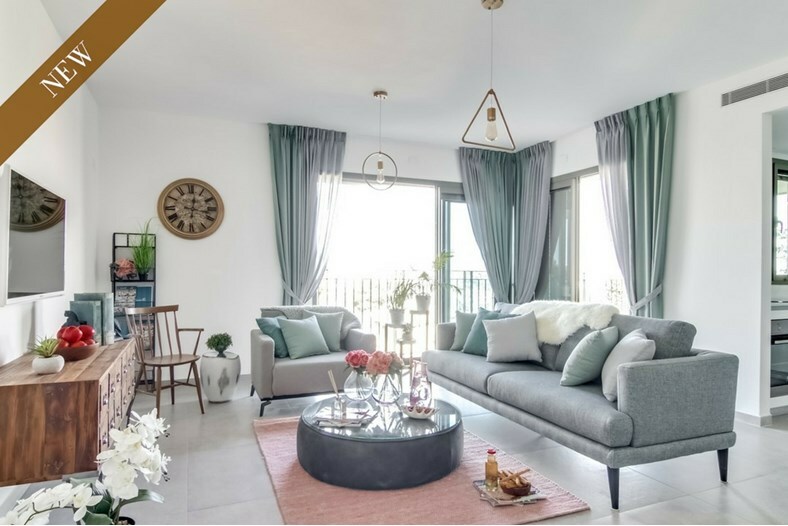 [KING DAVID RESIDENCE-203] : Gorgeous apartment in city center: 3 bedrooms (2 single beds + 1 double bed + 1 queen size bed), 2 bathrooms, living room, dining room, kitchen, A/C, 2 balcony, 1 terrace, all furnished. 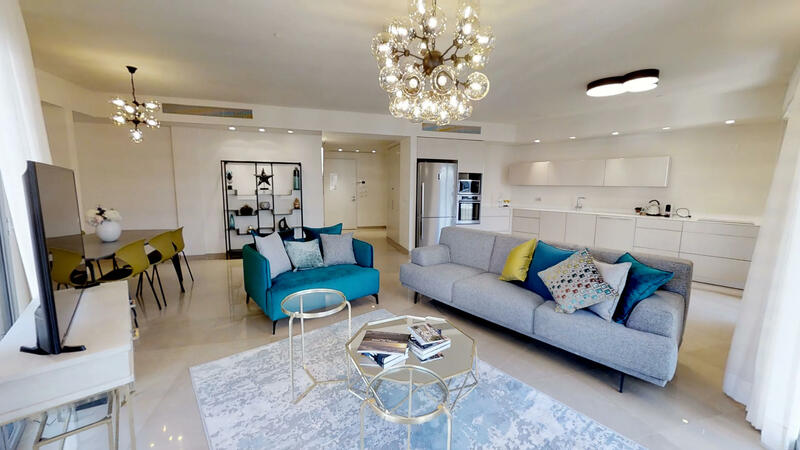 [MAMILLA - 402] : This beautiful apartment is located in the New Mamilla Shopping Arcade - Jerusalem's newest and most fashionable venue. This stretch of beautiful architecture, that connects the Old and New City, features an array of high-end shops, cafes and restaurants that offer an unforgettable shopping and entertainment experience. 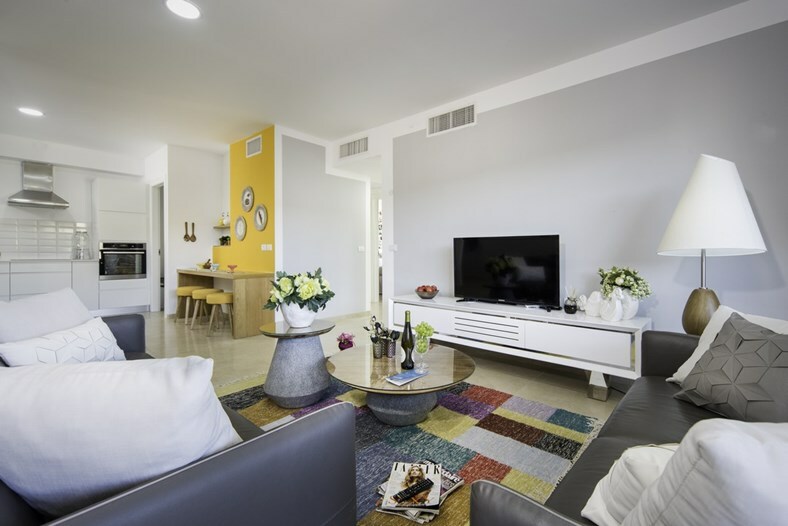 Situated minutes from the Old City’s Jaffa Gate and the historical Tower of David, the apartment offers proximity to Jerusalem’s most sacred sites and stylish walkways. The apartment is modern & comfortable with three bedrooms, two full bathrooms and guest toilet. The Living & Dining room area is spacious and sunny! It has all the amenities including a strictly kosher kitchen with two dishwashers & ovens, central air, wireless, electric blinds, flat screen TV & Cable, two private parking bays and magnificent views of the Old City from the balcony. Minimum 3 night stay, high season minimum stay 1 week. Guests must respect the laws of kashrut in the apartment and refrain from bringing in any non kosher items into the apartment. [KING DAVID RESIDENCE - 205] : Beautiful appartement located in city center : 3 bedrooms (2 single beds + 1 double bed + 1 queen size bed), 2 bathrooms, living room, dining room, kitchen, A/C, 1 balcony, all furnished. Centrally located with a 24-hour guard for added security, fitness room, a beautiful swimming pool, Shul, underground parking a Business Lounge for meetings and the Residents club Lounge in the lobby. Entrance level has a room with couch that opens to 2 beds. With a shower and toilet en suit. There is no door to the room. [LINCOLN - 4 BDR] : The apartment is located on Lincoln Street, flanking the prestigious hotels on one side, and the Great Synagogue in the center of the city, on the other side. 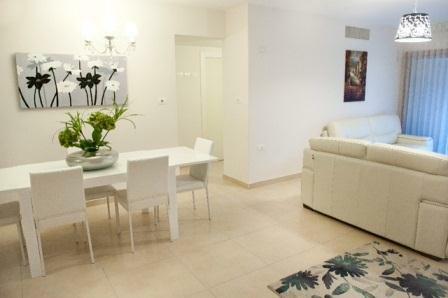 Spacious ground floor apartment, offering the ideal solution for large families vacationing in Jerusalem. The apartment features a large and spacious living room, with exit onto indoor balcony where can enjoy a quiet breakfast. If wish to enjoy the Jerusalem air – can sit out at the beautiful tended patio. There's a dining table, suitable for up to 12 sitting ppl. A modern outfitted kitchen. The apartment comprises of 4 bdr: 2 ensuites, third bedroom with two beds, and additional bedroom with a sopha bed for two. There's a third full bathroom. 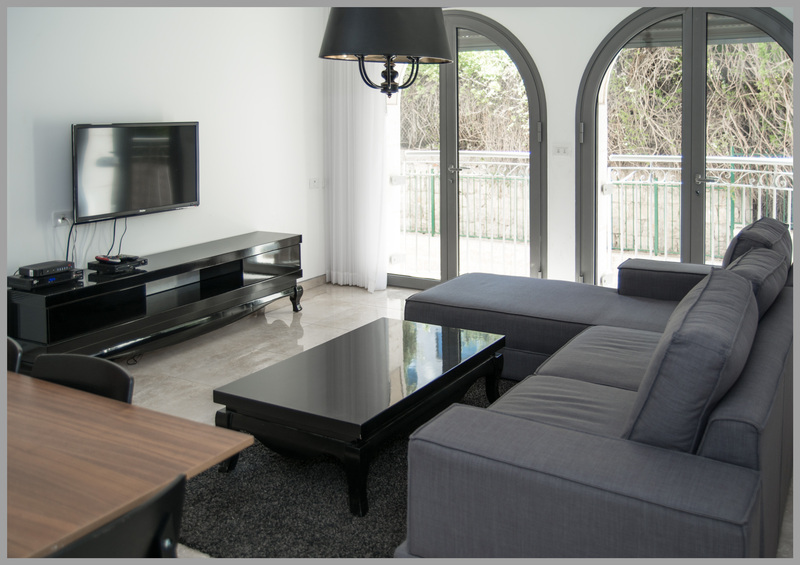 The apartment is furnished and equipped for a pleasant stay, a perfect blend between an hotel and home. Enjoy your home in Jerusalem away from home. Magnificent high standing apartment of 4 rooms located in full town center with an impregnable view. Ideal for holidays in family in pein heart of the capital and close to the highlights! 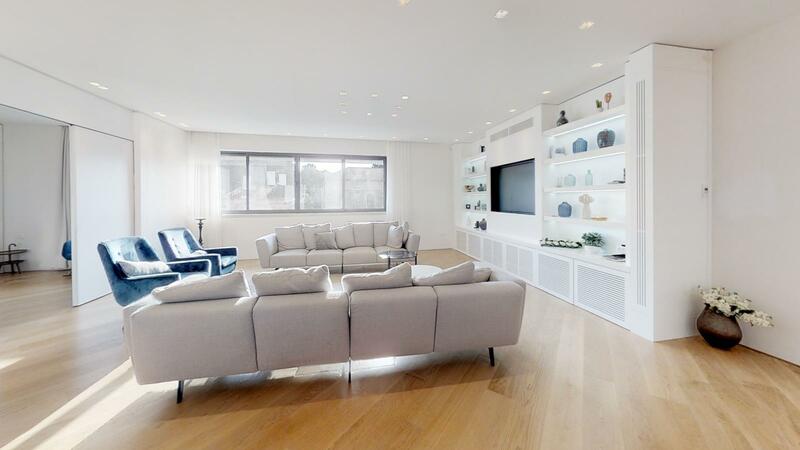 [KEREN HAYESOD] : Beautiful living room, dining area with Jerusalem stone wall. Dining table suitable for up to 12 sitting ppl. 3 bdr: master bdr (bathtub), second bdr with 2 beds, third bdr with 2 beds. 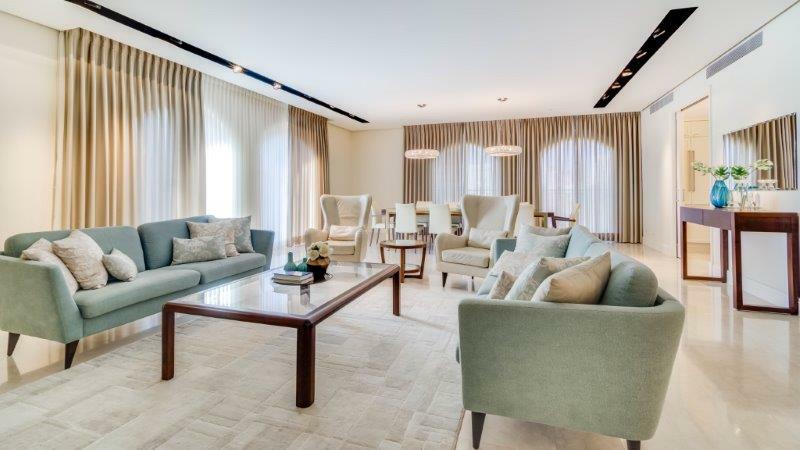 [LINCOLN - 3 BDR] : An elegant and luxurious apartment on Abraham Lincoln Street. High ceiling, marble and parquet floor. The apt has a spacious living room with exit onto 2 balconies. Dining table suitable for up to 12 sitting peoples. Welcome to a harmony of elegance and style. This apartment has been carefully designed with attention to all details, to offer you a treat of elegance and distinction. Ideal apartment for a family expecting a luxurious yet comfortable apt in a quiet setting. 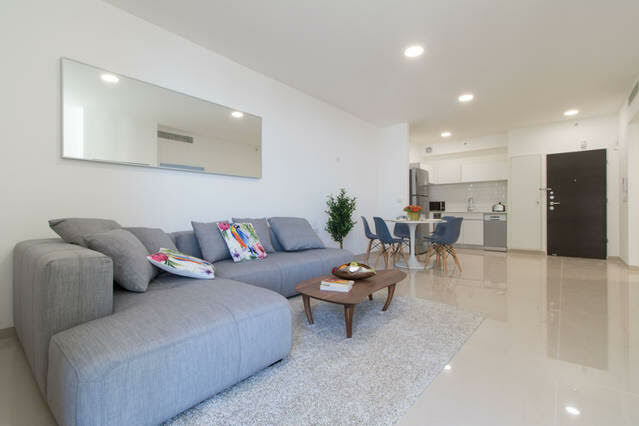 The apt is located on Lincoln St, enjoys a central location between the King David Hotel, Mamila promenade, and the city center, a walk away from the old City and main cultural venues. 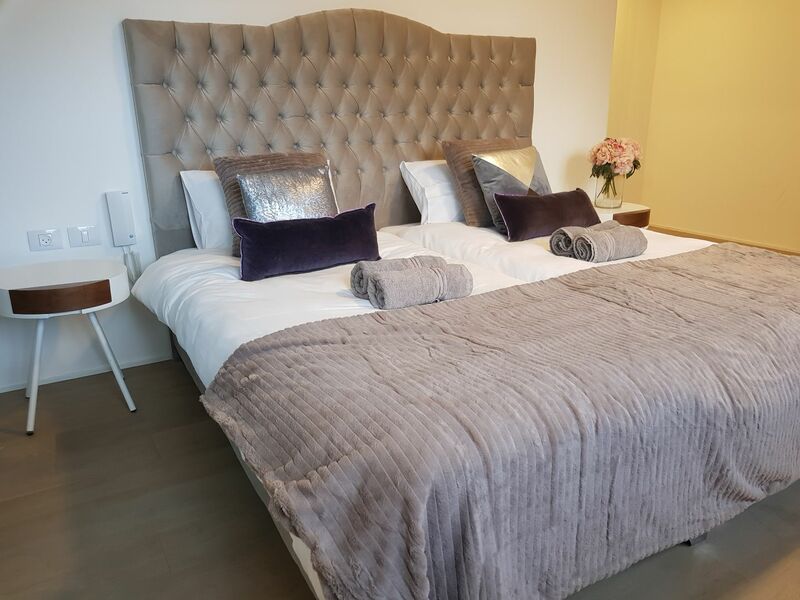 The apartment comprises 2 bedrooms: master bedroom with en suite bathroom, second bedroom with two beds, third pull out bed, and an extra open bed. Completely accessorized kitchen, dining area suitable for up to 8 ppl. Beautiful living room with home cinema, and indoor balcony with unique mashrabia designed wall. Enjoy privacy, elegance and style along with the warm feeling of home away from home. [WALDORF ASTORIA, C2-2, TH] : For those who appreciate total luxury in an atmosphere of calm and tranquility, the Waldorf Astoria Grand Suite offers the perfect retreat right in the heart of Jerusalem within walking distance to the old city. 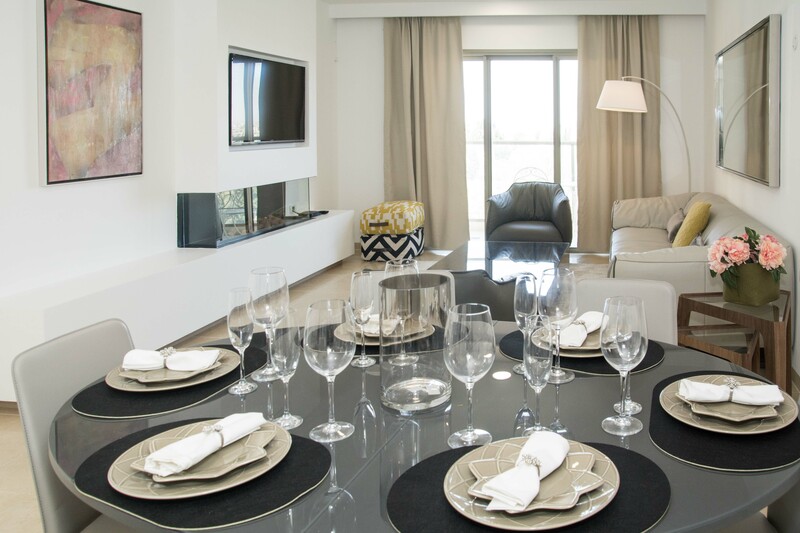 The suites feature a decorative living area, fully equipped and kosher kitchens. lavish marble bathrooms with shower, bathtub and guest powder room. 52-inch LED televisions in the bedrooms and living room, free Wi-Fi, balconies. The luxurious furnishings create the grandeur and intimacy of a Waldorf Astoria apartment. Stunning 3-room apart with 2 baths, suitable for 4 people with option to add folding beds and crib. (50$ per item per rental) Book today the ultimate premier accommodation in Jerusalem!! Looking forward to hosting you! [VILLA SUKKAH KING DAVID] : Goergeous Villa located in City Center close to the kotel and Mamilla street. 5 bedroom, 3 baths, fully furnished , with sukkah. The apartment comprises a bedroom with a suite bathroom, completely accessorized kitchen, dining area, living-room, and spare bathroom. Living room can be used as a second bdr, as the sopha can open to two separate beds. (the beds are not as high as the master bdr beds( There's second full bathroom and large sliding door for maximum privacy when used as a second bdr. 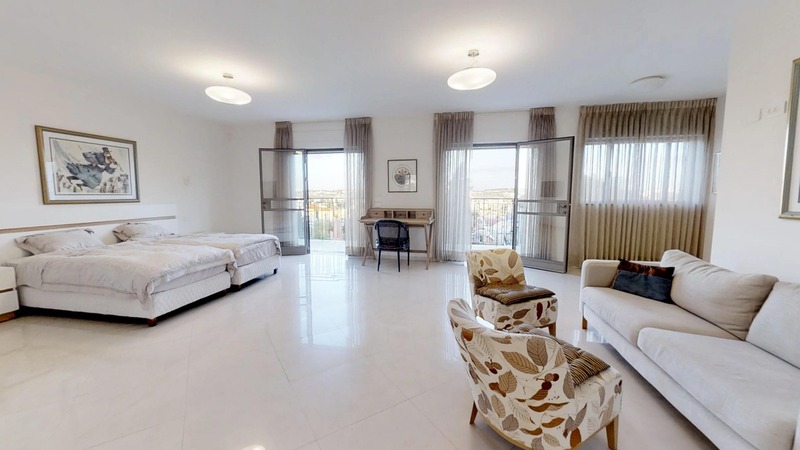 [HANEVIIM COURT 3BDRS] : This high-class apartment located in Jerusalem is comprised of 3 bedrooms and 2 bathrooms. 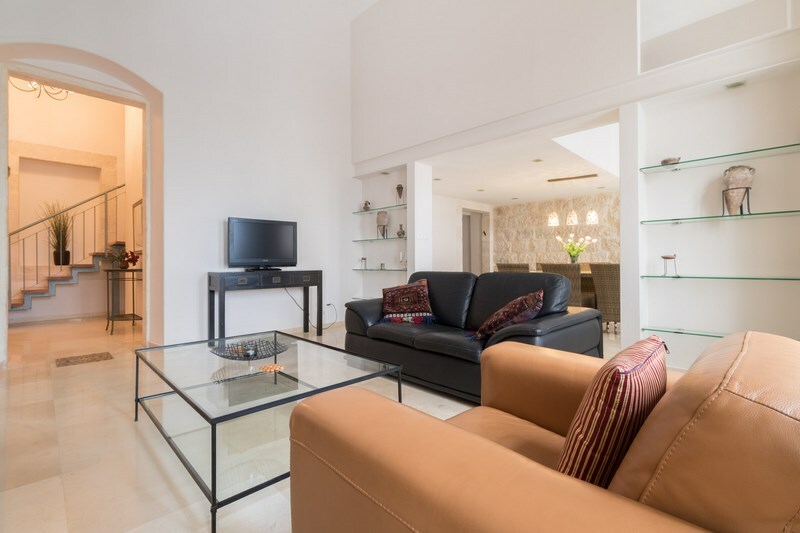 Located in the city center, this vacation rental is the perfect spot for a lovely stay in Jerusalem as the best sites are only a few minutes away on foot. Walk a small distance to reach Machne Yehuda Street Market (7 minutes), Mamilla Mall (10 minutes), and the Western Wall (25 minutes). It is also just a 4-minute walk to the bus station, as well as the light railway and other modes of transportation. 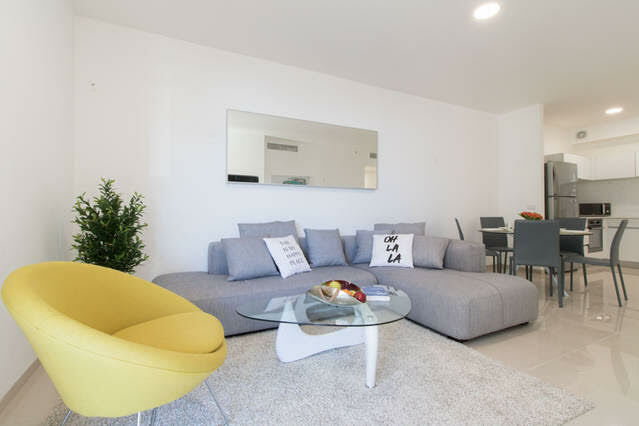 This renovated serviced apartment in Jerusalem provides fresh and funky still simple look, accomplished by the efforts of our local interior designers. The designers chose a classy and chic look. The grey, white, and lavender color combination adheres to the apartments renovated look and style. Its bright-eyed balcony allows guest to have the opportunity of spending quality time outdoors while still staying home. 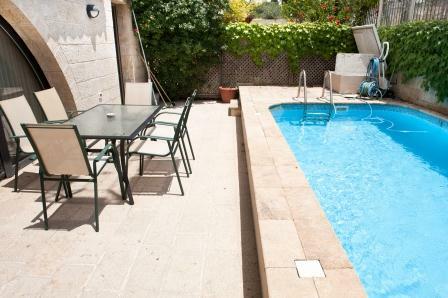 This vacation rental in Jerusalem is large and spacious enough for a family or group of up to 8 people. The combination of the comfortable and state-of-the-art furniture and fixtures makes this city-center building extremely accommodating to any type of guests, whether you are business travelers or tourists. You will be impressed by the beauty and well-furnished interior of the condo. The classical look of the furniture's hooks up to the surrounding giving a perfect combination for both comfort and an eye-candy for all. This apartment is the perfect choice for anyone looking to experience a relaxing, yet monumental time in one of the most cultural cities in the entire world. Have the classical feeling of this holiday apartment in Jerusalem sink deep into your heart which will eventually make your stay more memorable. open space kitchen, living room and dinning area. 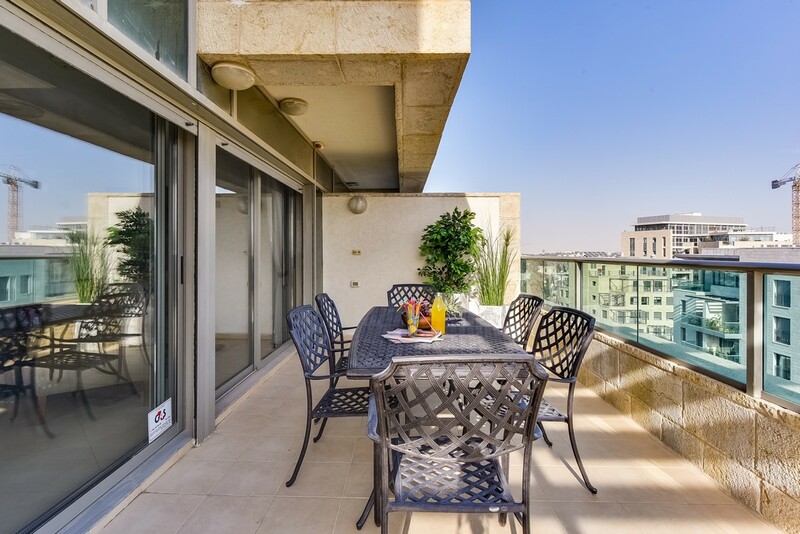 [LUPO] : In Talpiot neighborhood Lupo street, a renovated and furnished 5 rooms penthouse with a large sukkah balcony offering stunning views. This property is situated in an excellent location, close to shopping centers and entertainment areas. 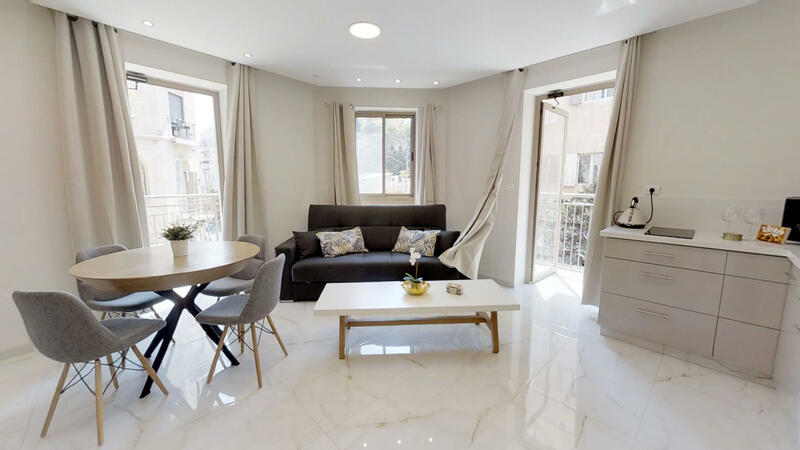 [HANEVIIM BOUTIQUE 3 BDR] : This boutique-style two-bedroom holiday apartment in Jerusalem delivers a slice of elegant living in the city's heart. Cafes, restaurants and shops are on the doorstep, with the Yaffo Street nearby (5 minutes) and the famous Ben Yehuda Street (7 minutes). The bustling Machane Yehudah Bazaar is a short stroll away (15 minutes). Nearby tourist attractions include the Kokia Visitor Centre, the Tiferet Yisrael Synagogue and the beautiful Holy Trinity Church (all 5 minutes) while local buses put the rest of Jerusalem within easy reach. 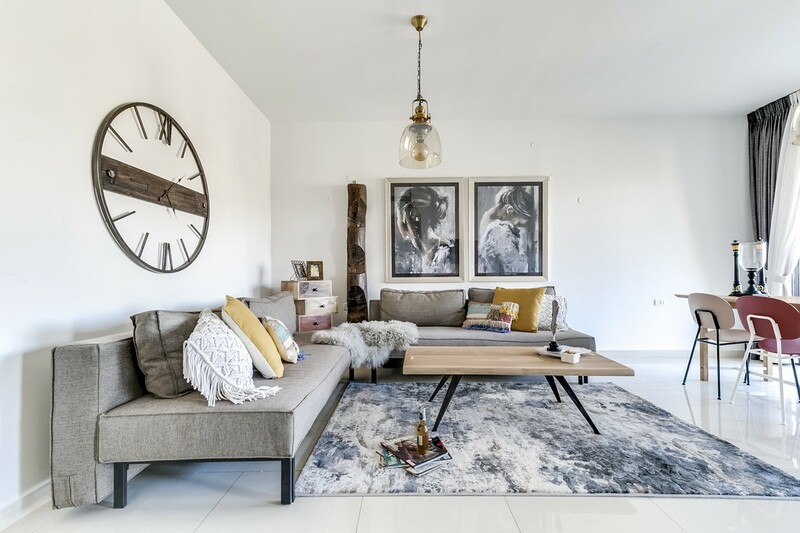 Our local interior designer has created a sophisticated yet relaxed look for this short-term rental in Jerusalem. 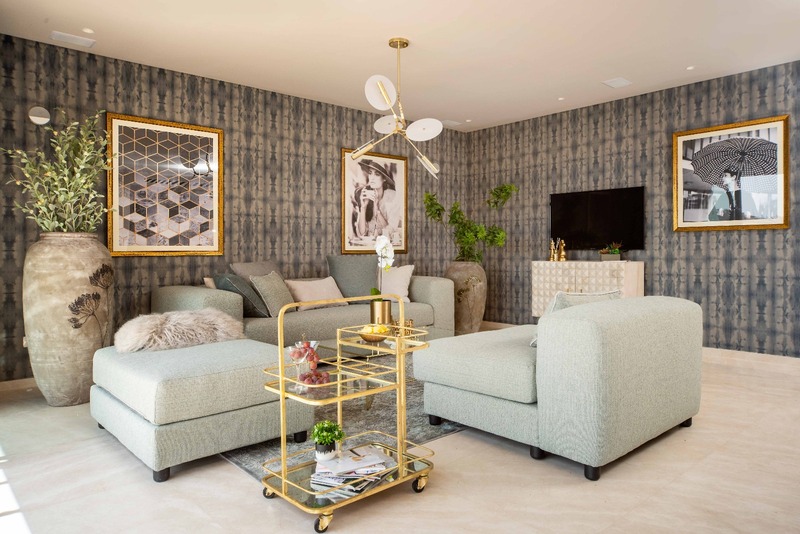 A fashionable grey palette provides the background for the decor and furnishings while contemporary wood furniture and hints of pink and aqua provide a colour contrast. In the living and dining area, quirky prints of flamingos add a bold touch. 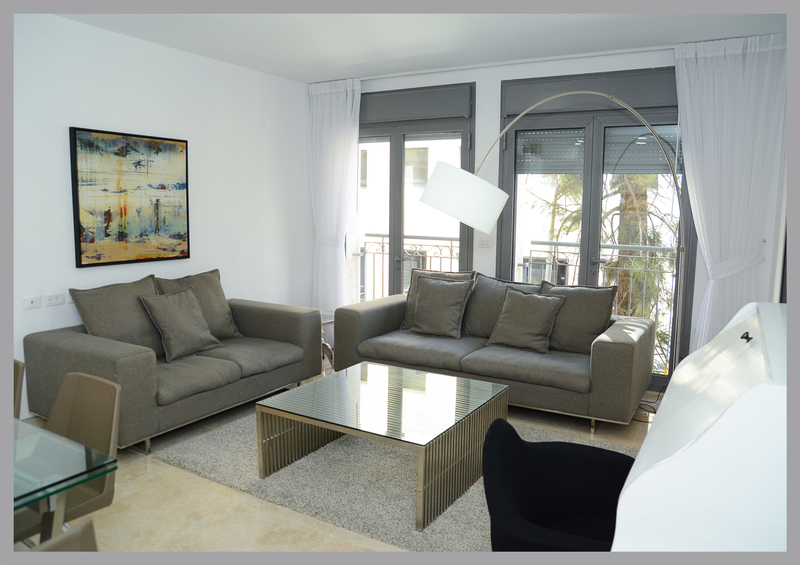 The living area is finished with a comfortable double sofa bed creating enough space in the apartment for six guests. A sleek and spacious kitchen alcove has all the appliances you need while the white-tiled bathroom features a shower over the bathtub. The colour palette is continued into the double bedrooms where clever storage solutions create an individual look. 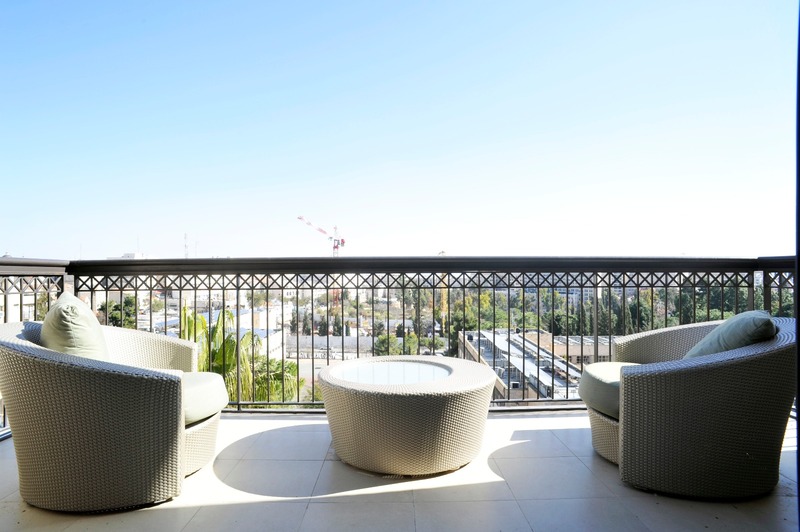 This luxury rental apartment in Jerusalem is finished with a large corner terrace complete with a bistro-style table and chairs, you will be amazed by its incredible view. Relax into city life as you uncork a bottle of wine to enjoy on your terrace as the sun sets over the city. 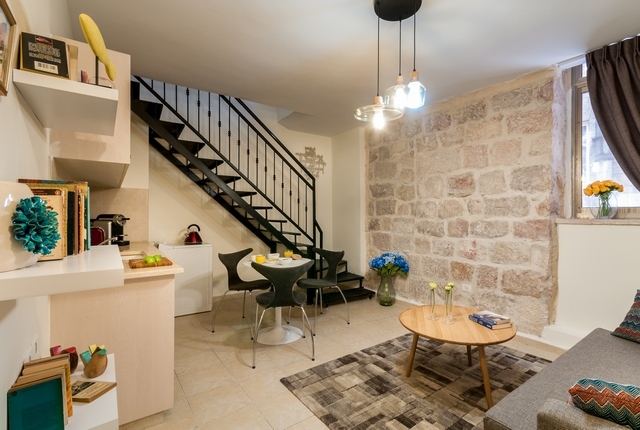 [HANEVIIM COURT 36] : Located in the city center, this vacation rental is the perfect spot for a lovely stay in Jerusalem as the best sites are only a few minutes away on foot. Walk a small distance to reach Machne Yehuda Street Market (7 minutes), Mamilla Mall (10 minutes), and the Western Wall (25 minutes). It is also just a 4-minute walk to the bus station, as well as the light railway and other modes of transportation. 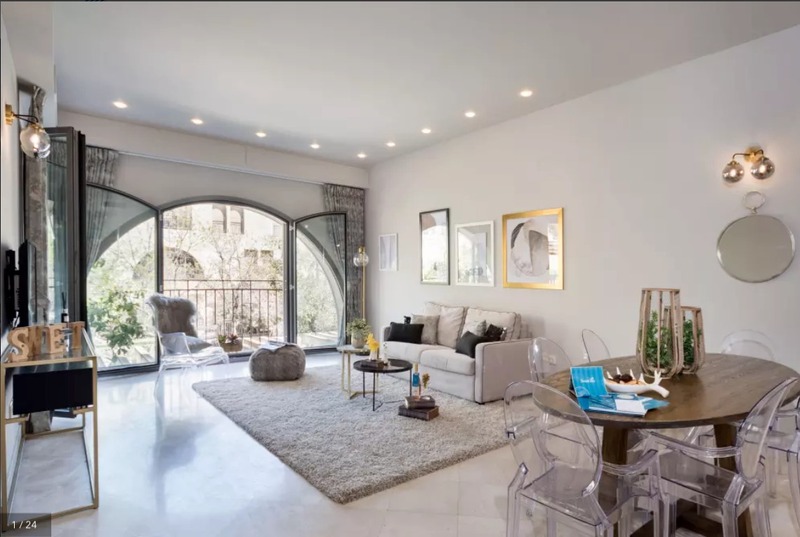 [VILLA MAMILLA] : Delight in this exquisite, newly-renovated vacation home in Talbieh, Jerusalem, a glamorous neighborhood melding superb location with pastoral greenery. 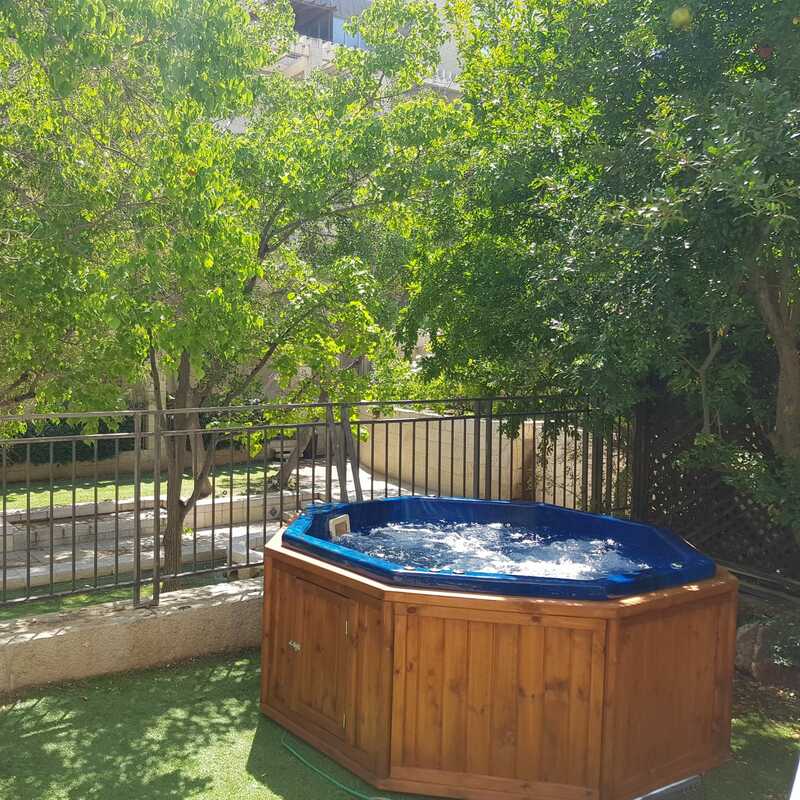 [HARAV HAGAN] : With two bedrooms and a shaded balcony, this vacation rental in Jerusalem is centrally located to tour the historic city. The City Centre is around the corner (3 minute walk), with cafes, bars, and shopping. For a lively experience, walk to the Machane Yehuda bazaar (10 minutes). The Jaffa Gate entrance to the Old City is a short stroll away (14 minutes), and the Church of the Holy Sepulchre is only a bit further on foot. A bus stop and light rail station are down the block (3 minutes). [DAVID VILLAGE with jacuzzi] : the best apartment at the best location! with jacuzzi! 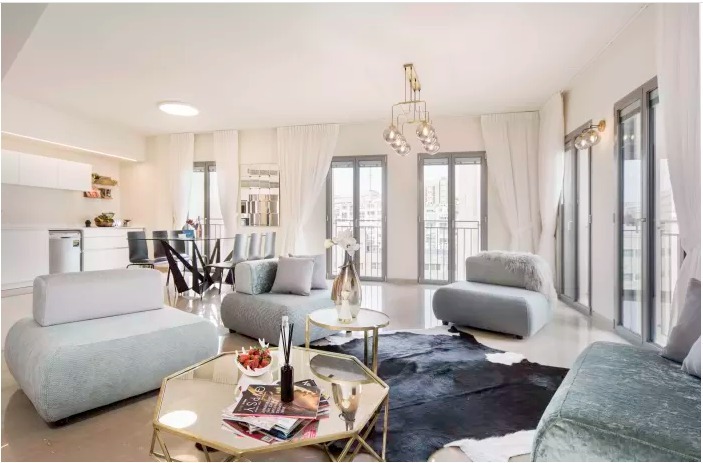 [MAMILLA 802] : Stay in this AMAZING designed 3 bdrs, 2.5 bths apartment magnificently located in the new Mamilla Alrov residences! 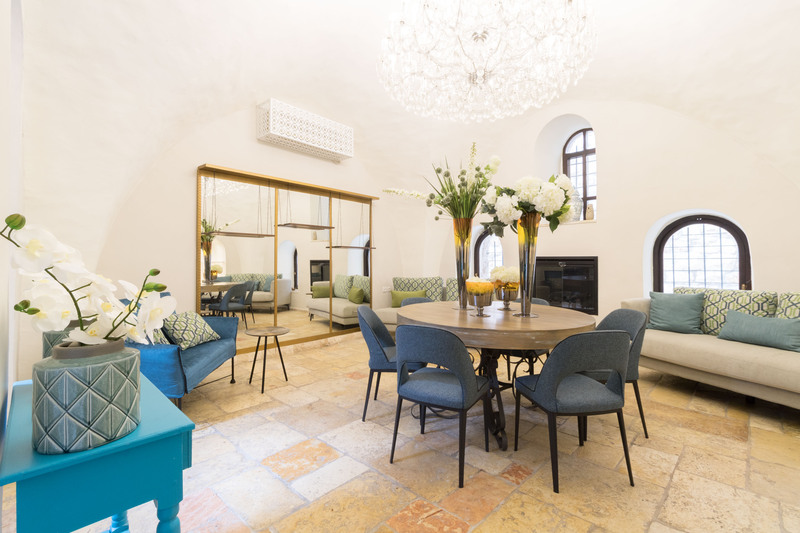 [JERUSALEM CITADEL] : Spacious and elegant, the 1-bedroom Jerusalem Citadel vacation apartment is a hidden hideaway in the Mamilla neighborhood of Jerusalem. 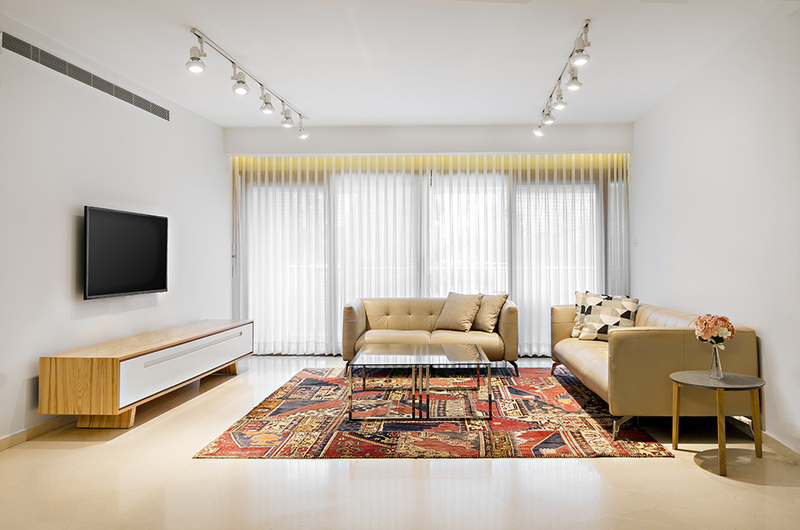 This apartment puts you within an 8-minute walk of Jerusalem’s world-famous Old City, where you can visit iconic sites like the Western Wall and Church of the Holy Sepulcher. The historic Mamilla pedestrian mall is just around the corner, and the hip restaurants and bars of the city center are within a 15-minute stroll. Bus and light rail stops are nearby. With huge picture windows, vintage decor, and marble accents, our local interior designers have captured Jerusalem’s sunlit glamour. A plush bedroom and state-of-the-art kitchen will make you feel at home. 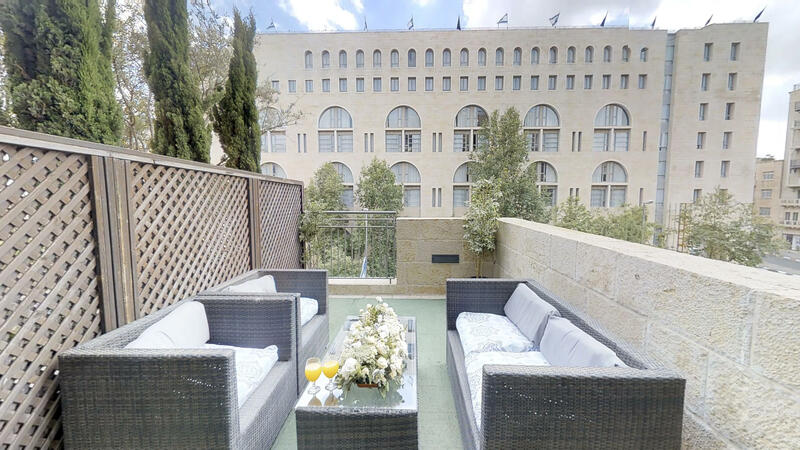 The furnished terrace, lined in Jerusalem stone, brings the splendor of the city to your doorstep. Premium amenities include free WiFi, cable TV, high-end toiletries, hotel beds and linens, and a Nespresso machine. 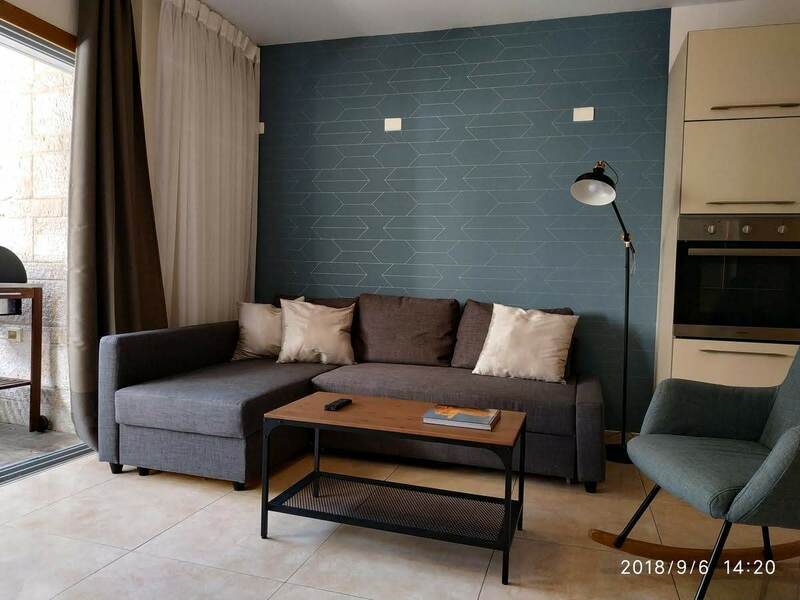 [King David 1 bedroom] : Nestled in Jerusalem’s historic Mamilla neighborhood, the 1-bedroom King David 22A holiday apartment has it all -- perfect location, modern comfort, and stunning design. A 10-minute walk brings you to the Old City, where historical sites such as the Tower of David and the Western Wall await you. The open-air Mamilla Mall (3 min) offers an array of shops, restaurants, and art galleries. Bus and light rail stops are right downstairs. Our local interior designers have combined exotic patterns, brass lighting, and wooden antiques to create an authentic Jerusalem atmosphere. The plush bedroom and fully equipped kitchen offer you all the comforts of home. Premium amenities include a Nespresso machine, free WiFi, cable TV, hotel beds and linens, and high-end toiletries. 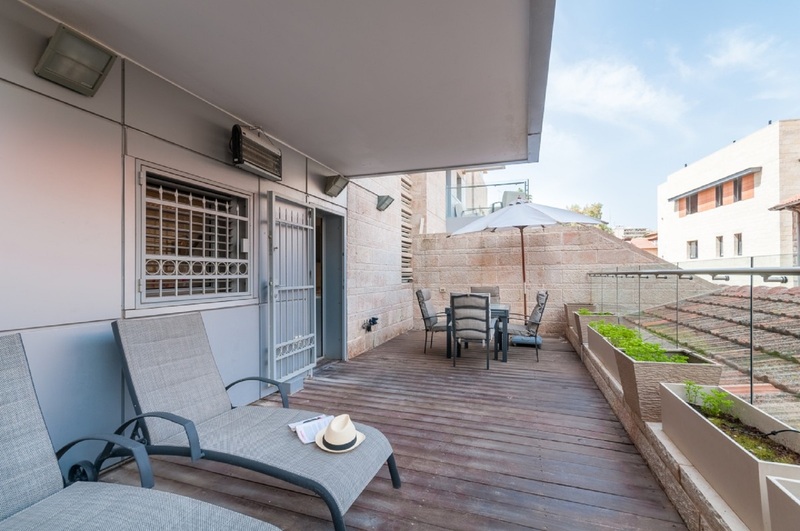 [rav kook] : In the city center of Jerusalem, the 2-bedroom Harav Kook Street apartment is a wonderful place to relax and revive. Jerusalem’s world-famous Old City is only a 15-minute walk away; ancient marvels such as the Western Wall and Church of the Holy Sepulchre await you inside. The bustling open-air Machane Yehuda market is within a 10-minute walk, and cafes and restaurants are right on your doorstop. Bus and light rail stops give you easy access to the rest of the city. Our local interior designers have decorated this sophisticated space with elegant antiques and industrial-chic accents. Two plush bedrooms, a sofa bed, and a fully equipped kitchen will make you feel right at home. Relax with a glass of local boutique wine on the cozy, furnished balcony. Premium amenities include free WiFi, high-end toiletries, hotel beds and linens, cable TV, and a Nespresso machine. Perfect for families or groups of friends, this gorgeous, central apartment is a traveler’s dream. 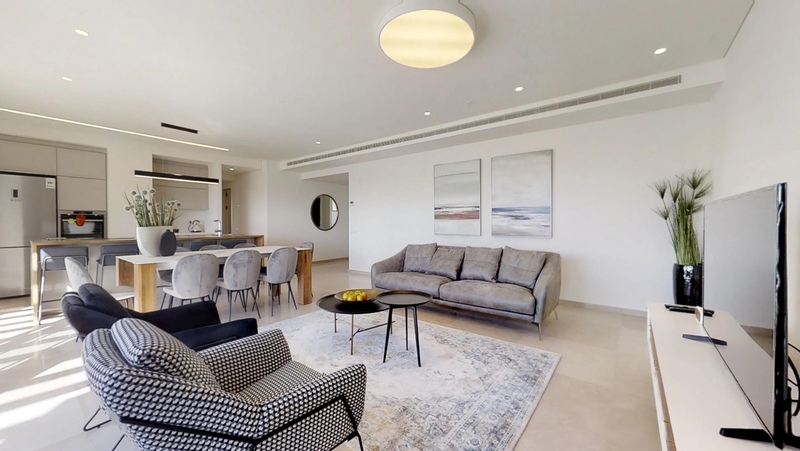 [Mamilla boulevard 2 bedr] : In Jerusalem’s historic Mamilla neighborhood, the spacious 2-bedroom Mamilla Boulevard II vacation apartment invites you to explore a new world. The apartment is located only a 7-minute walk from the Old City of Jerusalem, with its ancient sights and stunning Jerusalem stone. The Mamilla pedestrian mall is just outside your door, and the panoramic promenades and famous windmill of Yemin Moshe are within an 8-minute walk. Nearby public transportation, including multiple buses and the speedy Jerusalem light rail, gives you full access to the rest of the city. 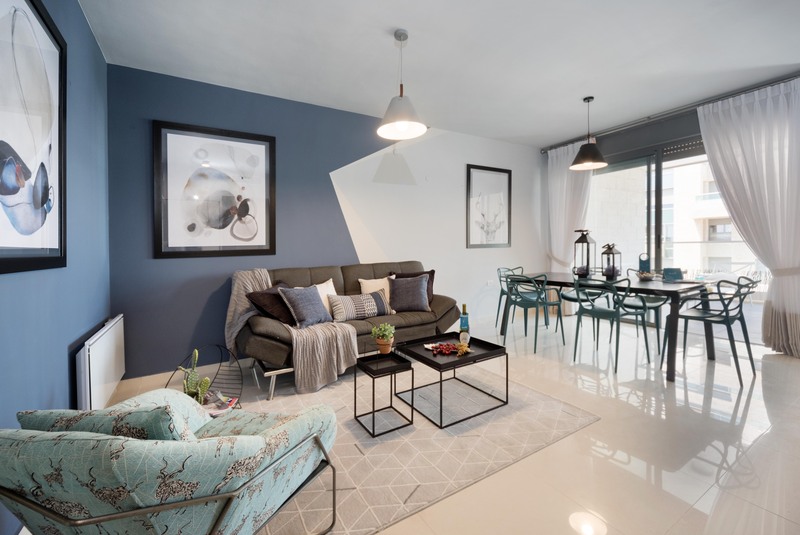 [King David crown] : In Jerusalem’s upscale Talbieh-Rechavia neighborhood, the 3-bedroom King David Crown holiday apartment is modern, spacious, and sunny. It’s a brief walk to many of the city’s most famous attractions, including the Old City (10 min), where the history of three major religions awaits you. Browse the boutiques at the historic Mamilla pedestrian mall (8 min), then take in an art film at the Jerusalem Cinematheque or a lecture at the Menachem Begin Heritage Center (10 min). A bus stop is right outside the apartment. With a sun-drenched outdoor terrace and a huge picture window, our local interior designers have brought Jerusalem to your doorstep. Three double bedrooms and a sofa bed give you plenty of room to breathe, and a fully equipped kitchen makes casual dining easy. Premium amenities include free WiFi, cable TV, high-end toiletries, hotel beds and linens, and a Nespresso machine. 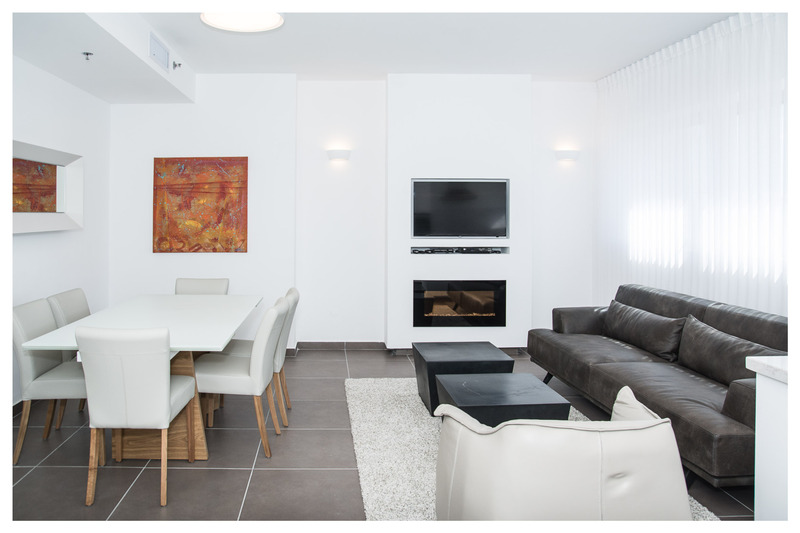 A holiday haven for families, this centrally located apartment will be your key to the city. 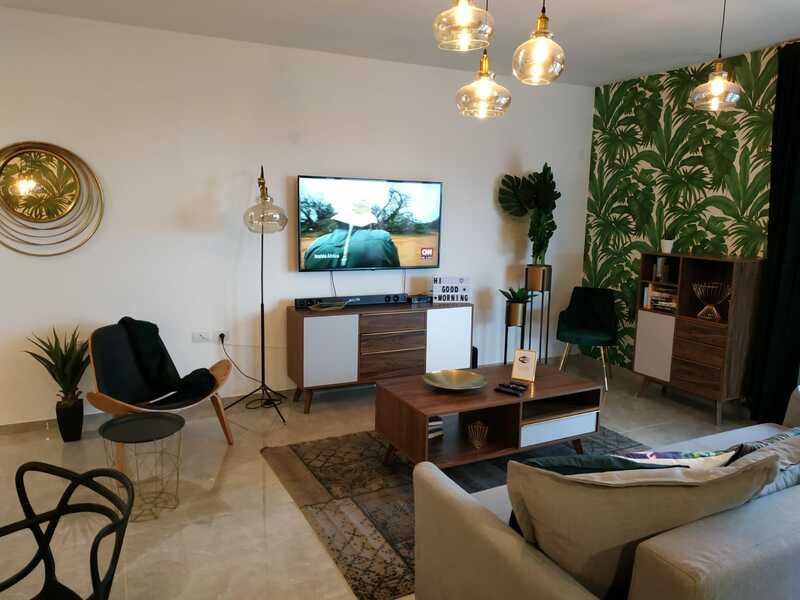 [Strauss] : Located in the City Center of Jerusalem, the spacious 3-bedroom Strauss apartment is in the ideal spot for touring. The Old City gates (14 minutes’ walk) hold the incredible history of three major religions within. Haggle with vendors and sample local delicacies at the open-air Mahane Yehuda Market (8 min), or browse the the trendy Mamilla shopping avenue (11 min). For more recent history, don't miss the charming Ticho House (7 min), a restored 1860s mansion and art museum. The Davidka and Yaffo-Center light rail stops are within a 5-minute walk, and bus stops are just outside the apartment. 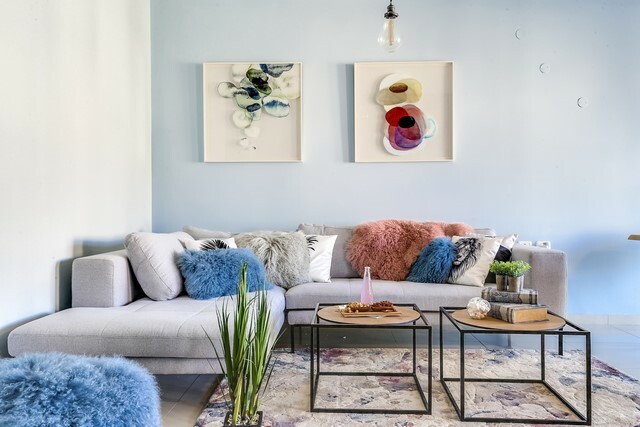 With a soft color palette and eclectic artwork, our local interior designer has tailored this vacation apartment for a comfortable stay. Take in the city through the large windows or on the private outdoor terrace. You’ll love the plush bedrooms and and state-of-the-art kitchen. Premium amenities include free WiFi, cable TV, hotel beds and linens, luxury toiletries, and a Nespresso machine. Perfect for a family getaway, this centrally located vacation apartment makes it easy to explore. 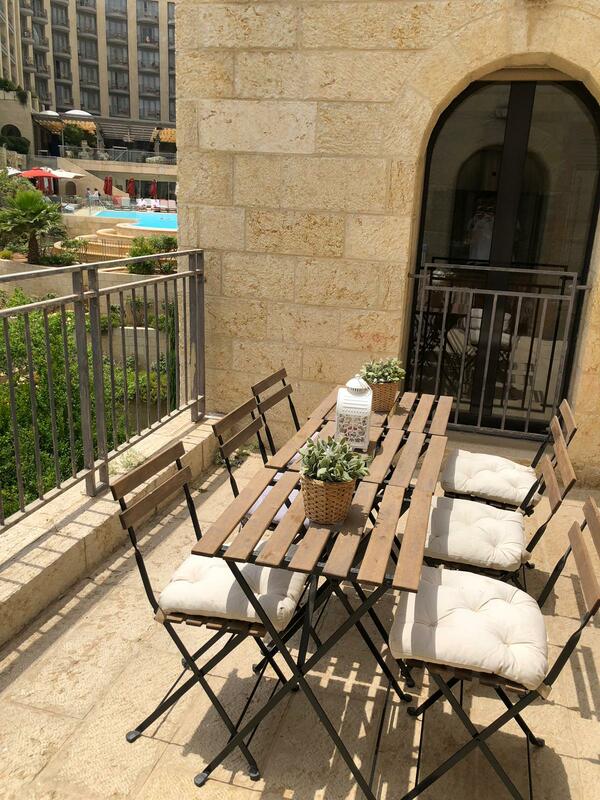 [haneviim court 2 bedrs] : Just steps from Jerusalem’s Old City, the 2-bedroom Haneviim Court IV vacation apartment offers a sun balcony with fabulous views. The apartment puts you within walking distance from the city's most iconic attractions, including historic Mamilla (8 minutes) and the Western Wall (10 minutes). A 15-minute walk brings you to the open-air Machane Yehuda market, where you can haggle with vendors and sample local delicacies. The Yafo-Center, Davidka, and City Hall light rail stops are nearby, as are several bus stops. Best of all -- free parking makes it easy to get around. Housed in a sleek, modern building constructed from Jerusalem stone, this apartment combines an old-world Middle Eastern vibe with modern chic. Our local interior designer has created a city oasis, with two plush bedrooms, a spacious living area, and a fully equipped kitchen. Premium amenities include a Nespresso machine, free WiFi, cable TV, hotel beds and sheets, and high-end toiletries. Ideal for families and groups of friends, this gorgeous apartment is an unforgettable Jerusalem experience. picnics, or taking the kids to play. shared bathroom is next to the den. sound speakers. The couch converts to an additional 2 beds. 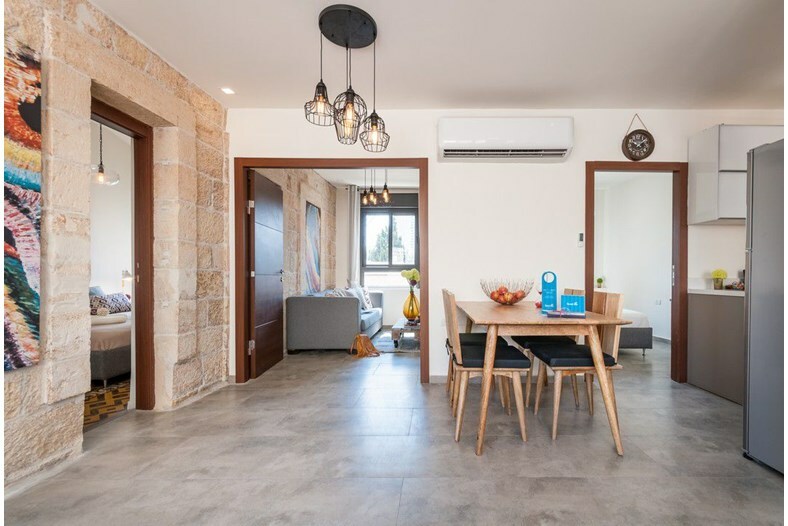 [YEMIN MOSHE] : Located 1.1 km from Western Wall, Art apartment in Yemin Moshe offers air-conditioned accommodation with a balcony and free WiFi. There is also a kitchen in some of the units equipped with an oven, a microwave, and a fridge. Dome of the Rock is a 15-minute walk from the apartment, while Church of All Nations is 1.7 km away. The nearest airport is Ben Gurion Airport, 42 km from the property. 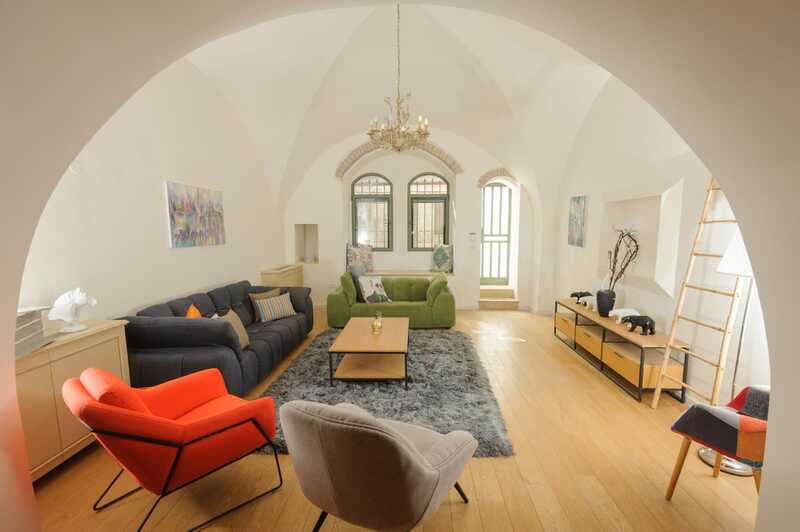 [KING DAVID V] : Located in the elegant Mamilla neighborhood, the 3-bedroom King David V apartment puts you in the heart of old Jerusalem. Take a scenic stroll (9 minutes) down to the Old City of Jerusalem. The Western Wall and the Church of the Holy Sepulchre are only a short walk through the ancient stone streets (17 minutes). The apartment is just 5 minutes from the restaurants and boutiques of the lively Mamilla pedestrian mall, and the famous King David Hotel is mere steps away. Local buses and a light rail station are right outside. 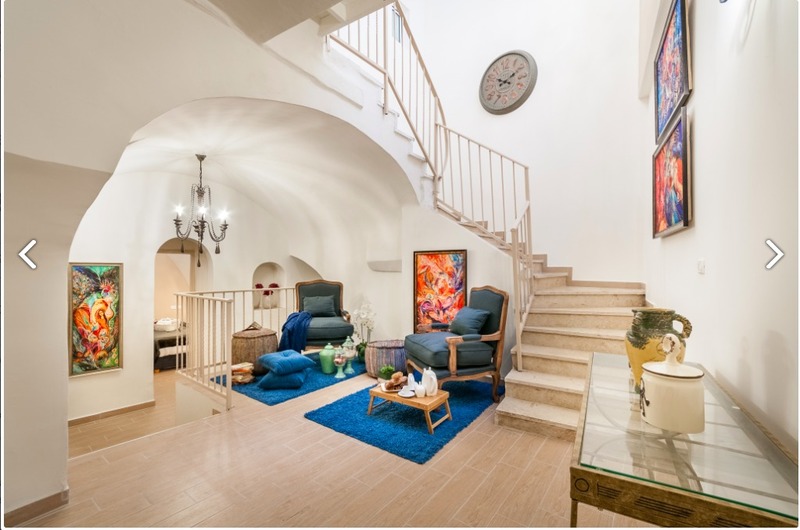 Our local interior designers have used gentle watercolors and Jerusalem stone to create an enchanting Mediterranean space. You’ll love the huge windows, the plush bedrooms, and the state-of-the-art kitchen. Premium amenities include free WiFi, cable TV, high-end toiletries, hotel beds and linens, and a Nespresso machine. Perfect for a family retreat or a group of friends, this apartment is a great place to unwind after a long day of touring. [VILLA BEN MAIMON] : In this luxury Jerusalem rental Experience a special atmosphere on Shabbat in this super-luxurious fully furnished private home in Jerusalem – a brand new 8-bedroom house on Ben Maimon Street.You will be living on 4 floors with private elevator and private pool ,with a very large living room and equally large private balcony. Parking is included, and a sukkah fits 40-50 comfortably. Washer/dryer, internet, AC.all this in one of the best Jerusalem house rental. [Mamilla 809] : THE BEST LOCATION IN TOWN! Across the street from the David Citadel hotel, minutes away from the Jaffa gate and old city and right above the MAMILLA MALL. 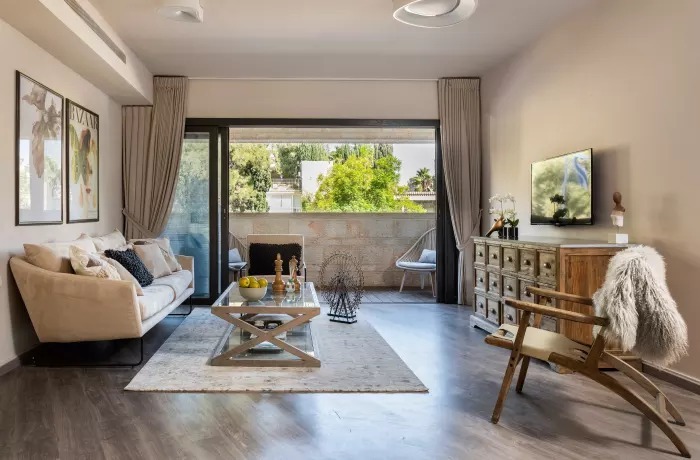 [chovevey tzion] : On the tree-lined streets of Talbieh, the spacious 3-bedroom Hovevei Tsiyon apartment is an oasis in the heart of Jerusalem. Walk 18 minutes to the Zion Gate of the Old City, where ancient sites and glowing Jerusalem stone beckon you within. Wander through the historic Yemin Moshe neighborhood (10 minutes), then dine at the First Station or take in an art film at the Jerusalem Cinematheque. Nearby bus stops will take you anywhere you want to go. Our local interior designers have blended the old and the new in this unique apartment. Hand-carved wooden accents and a facade of Jerusalem stone set this space apart, and a furnished outdoor terrace brings the beauty of the city to your doorstep. You’ll love the sunlit living room, three plush bedrooms, and fully equipped kitchen. Premium amenities include free WiFi, cable TV, high-end toiletries, hotel beds and linens, and a Nespresso machine. 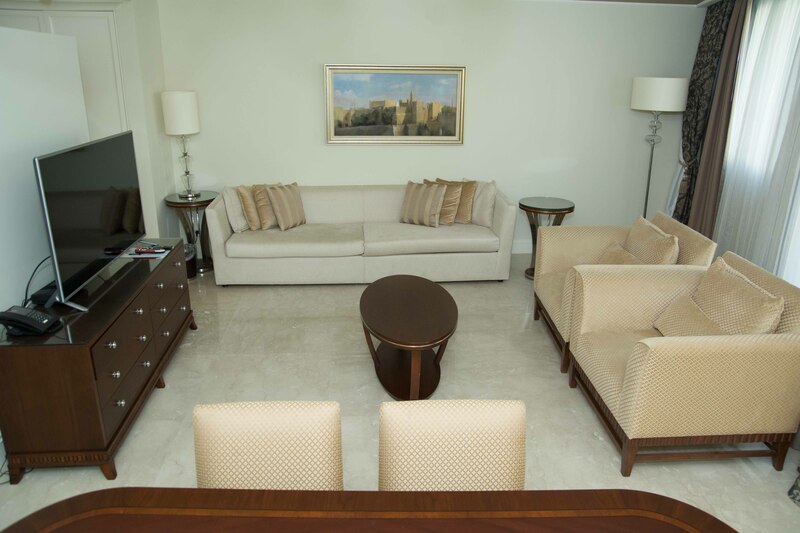 Perfect for a family retreat, this apartment combines Jerusalem splendor with all the comforts of home. 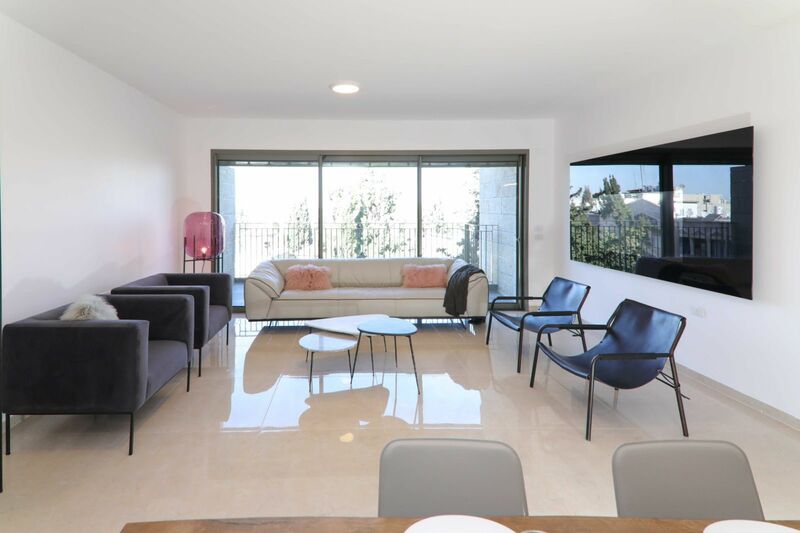 [NEOT DESHE KFAR DAVID] : In an attractive building in Jerusalem’s exclusive Mamilla neighborhood, the 2-bedroom Mamilla vacation apartment in Jerusalem overlooks beautiful gardens. The famous open-air Mamilla Mall, with chic boutiques and restaurants housed in historic buildings, is only steps away. The ancient sites of the Old City are just a 9-minute stroll from the apartment, and the diverse restaurants and shops of Yafo Street are 10 minutes away. Bus stops and the City Hall light rail station are nearby. 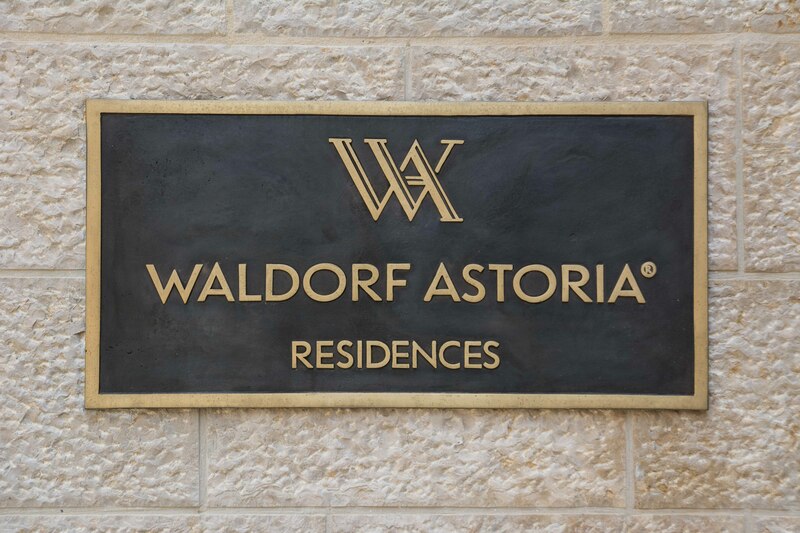 [WALDORF ASTORIA-C3, THE RO] : For those who appreciate total luxury in an atmosphere of calm and tranquility, the Waldorf Astoria residence Suites offers the perfect retreat right in the heart of Jerusalem within walking distance to the old city. 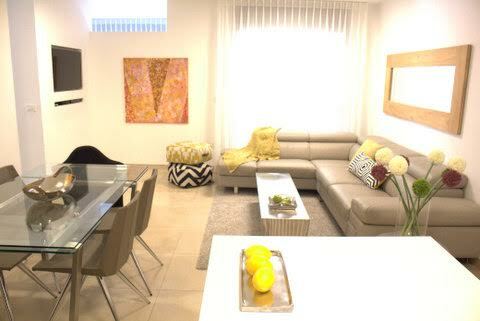 The suites feature features a decorative living area, fully equipped and kosher kitchens. lavish marble bathrooms with shower, bathtub and guest powder room. 52-inch LED televisions in the bedrooms and living room, free Wi-Fi, balcony. The luxurious furnishings create the grandeur and intimacy of a Waldorf Astoria apartment. [WA ASTORIA C3-2 PRINCESS] : For those who appreciate total luxury in an atmosphere of calm and tranquility, the Waldorf Astoria Grand Suite offers the perfect retreat right in the heart of Jerusalem within walking distance to the old city. 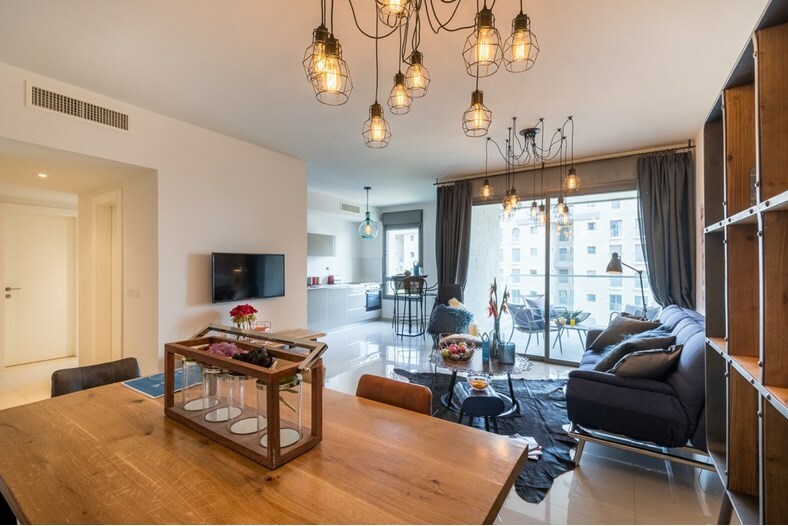 [YAFFO III] : In the busy city center of Jerusalem, the chic 1-bedroom Yaffo III vacation apartment will be your home away from home. This lively neighborhood is known for its bustling streets and diverse food scene. The Old City of Jerusalem is only a brief stroll away (12 min) via the centuries-old Jaffa Gate. Dine alongside the Israeli literati at the Tmol Shilshom cafe and bookstore (2 min), or head over to the open-air Mahane Yehuda Market (14 minutes) to haggle over fresh produce, local delicacies, and handicrafts. The Yaffo-Center light rail stop is close (4 min) as are several bus stops. Our local interior designers have created a sunlit, romantic space in this vacation apartment. With its open-plan kitchen and book-filled shelves, the apartment offers its guests all the highlights of a home in a convenient hotel setting. A plush bedroom invites you to rest your head after a long day. Premium amenities include free WiFi, cable TV, high-end toiletries, hotel beds and linens, and a Nespresso machine. 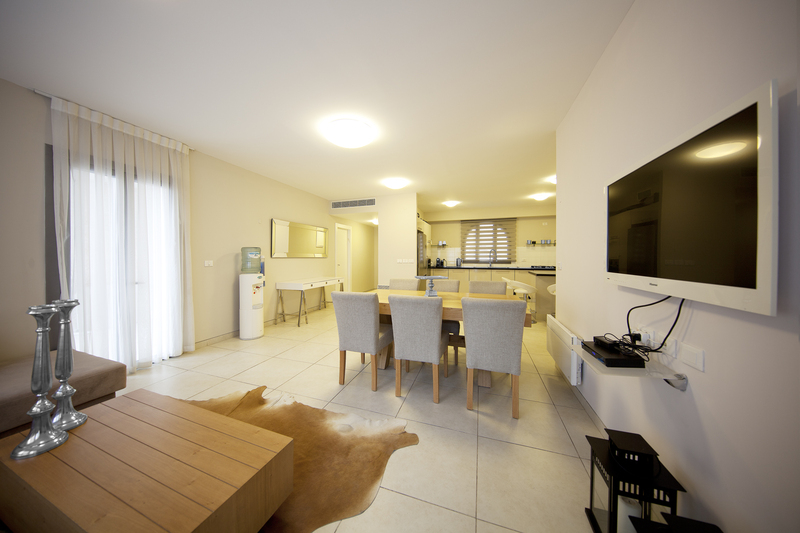 [Agan IV] : Spacious and inviting, the 2-bedroom Agan IV apartment is a sunlit retreat in the City Center of Jerusalem. The Jaffa Gate entrance to the Old City is a short stroll away (14 min); here, you’ll find many of the world’s most iconic religious and historical sites. The cafes and shopping of the Ben Yehuda pedestrian mall are only 3 minutes’ walk away. For a lively Middle Eastern experience, walk to the Machane Yehuda bazaar (10 min). Bus and light rail stops are just down the street (3 min). Best of all -- free parking makes it easy to explore the city. Inspired by the rich colors of sky and sea, our local interior designer has created an elegant yet comfortable hideaway. Deep blue walls, flowing drapery, and huge picture windows give an air of romance to the space. A fully equipped kitchen has everything you need for dining at home. 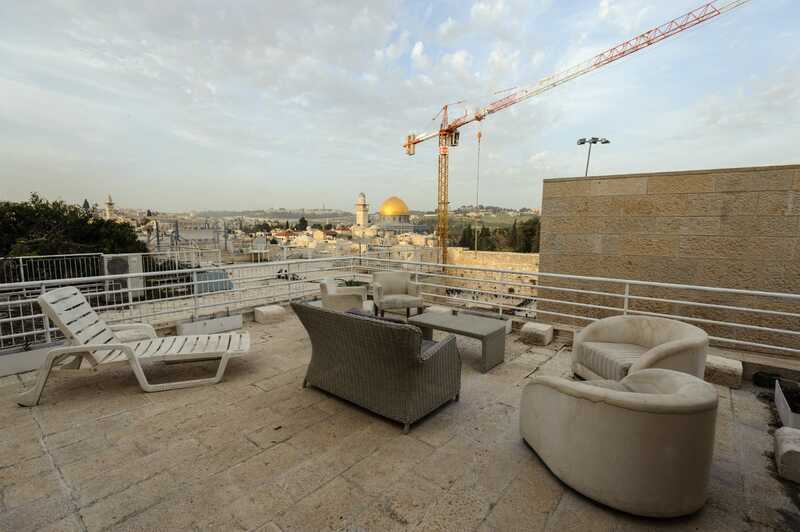 A furnished terrace overlooks the city, bringing the stunning Jerusalem skyline straight to you. Premium amenities include free WiFi, cable TV, hotel beds and linens, luxury toiletries, and a Nespresso machine. Ideal for families or groups, this apartment is a perfect introduction to the beauty of Jerusalem. 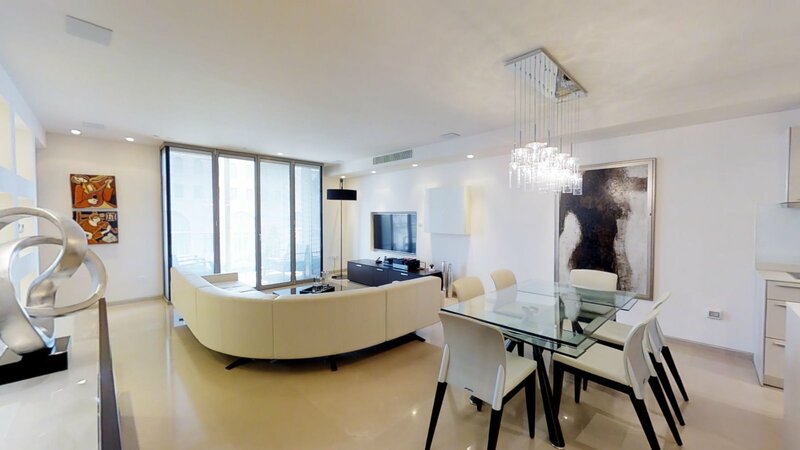 [Luxury Penthouse Tnuva] : This Luxury centrally located Penthouse in Jerusalem available for rent is unlike anything you have ever seen before. Enjoy a private rooftop with a heated swimming pool and a jet spa, as well as huge balconies. Watch the sunrise and sunset from the dining room windows. Set on an entire floor and the highest point of the Tenuva complex, we have views of almost the entire Jerusalem including har hazaisim- mokem hamikdash. Fully furnished and equiped with everything you need to enjoy your vacation including 5 bedrooms and 5 bathrooms (3 ensuites). Sleeps 12 plus 2 baby cribs. Shabbos Lift. Located in close proximity to Belz, Ger, Geula and Meah Shearim .It’s floor eleven. There is a shabbos elevator. 210+ Sqm and over 100 sqr metre of porch. 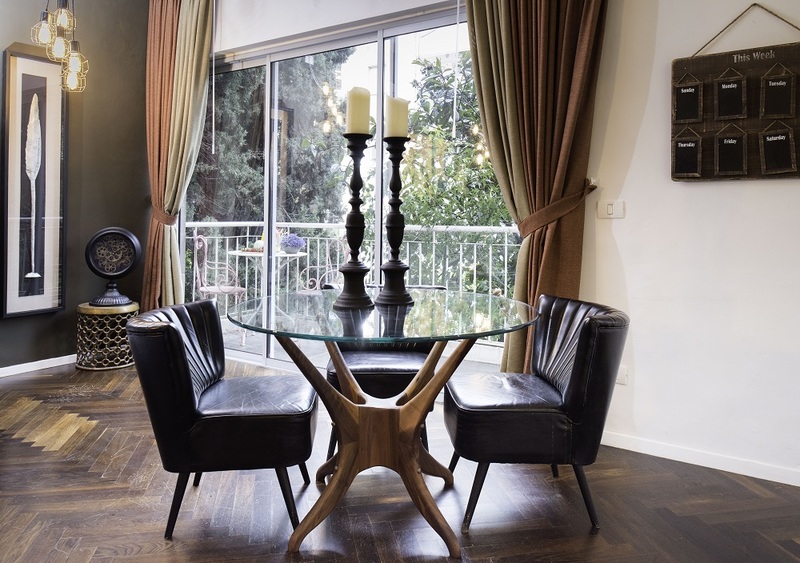 [AGAN III] : Spacious and artistic, the 2-bedroom Agan III vacation apartment puts you in Jerusalem’s bustling City Center. You’ll find great dining, nightlife, and shopping right at your doorstep. It’s easy to walk to many of the city’s most famous attractions, including the Old City (20 min), Mamilla Avenue (15 min) and the Mahane Yehuda Market (10 min). Buses are right downstairs and the central train station is nearby (20 min). Guests seeking sophisticated lodgings in an ideal location will love the chic decor, carefully chosen by our local interior designers. Set in a brand-new Jerusalem stone building, the apartment boasts a sun-drenched balcony and fully equipped kitchen. Two bedrooms and a fold-out sofa sleep up to 6 people comfortably. Premium amenities include a Nespresso machine, free WiFi, cable TV, hotel beds and linens, and high-end toiletries. 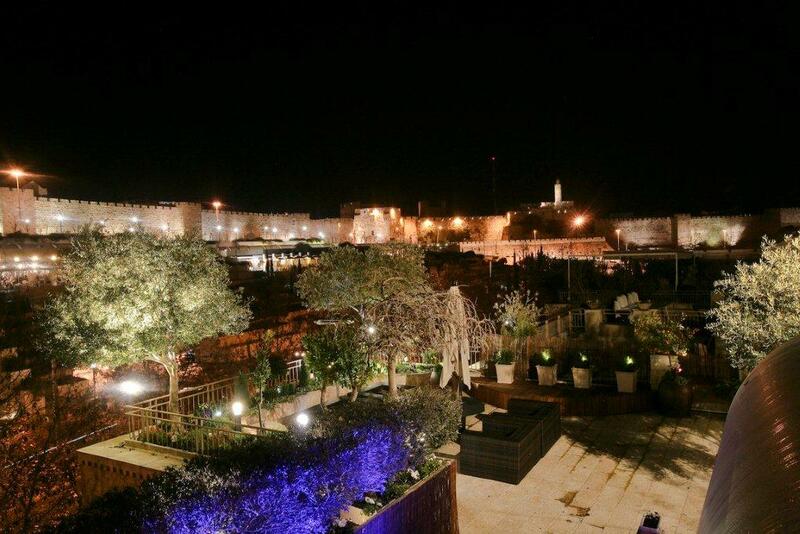 [ROVAH YEHUDI ,OLD CITY] : Apartment 1 bedroom,1 bathroom, 4 guests, terrace with western wall view. ​ Accommodation with air conditioning. Guests staying at this apartment have access to a fully equipped kitchen. Leading onto a terrace, this apartment comes with 1 separate bedroom. The apartment also features a bathroom with a bath. 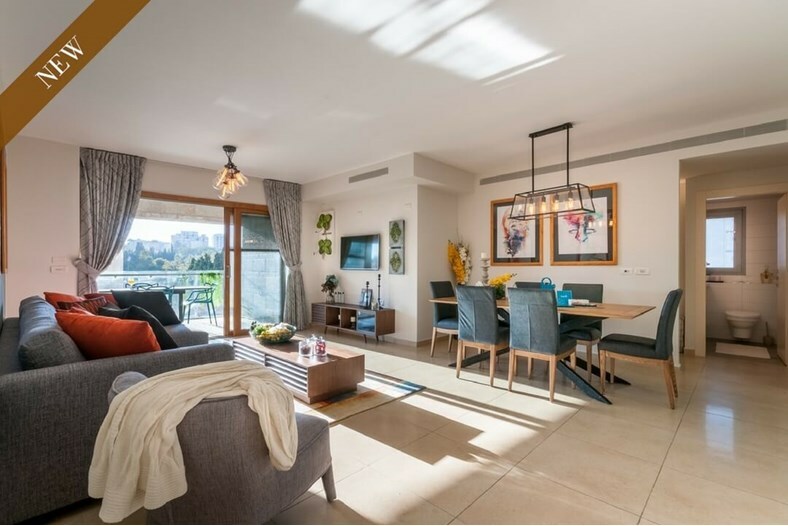 [king david 22- 2 bedr] : Located in Jerusalem’s exclusive Mamilla neighborhood, the King David 22 is a stunning 2-bedroom holiday apartment just steps away from the Old City. The Old City is a short walk (10 min) and the fabulous shopping and historic buildings of Mamilla Mall are at your doorstep (5 min). Enjoy the musical water jet show at Teddy Park (5 minutes). Buses and a light rail stop are right down the street. 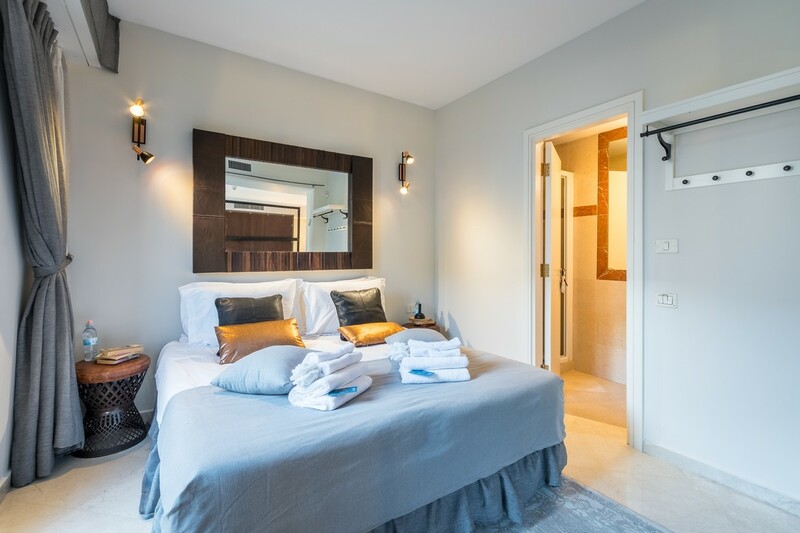 Newly renovated by our local interior designers, this spacious vacation apartment can accommodate up to eight guests in style. Traditional Jerusalem stone and antique furniture add old-world elegance. You’ll love the plush bedrooms, along with modern perks such as a state-of-the-art kitchen and a pool table. Premium amenities include a Nespresso machine, free WiFi, hotel beds and linens, high-end toiletries, and cable TV. Perfect for families or groups, this 2-bedroom apartment offers sophisticated living in a prime location. 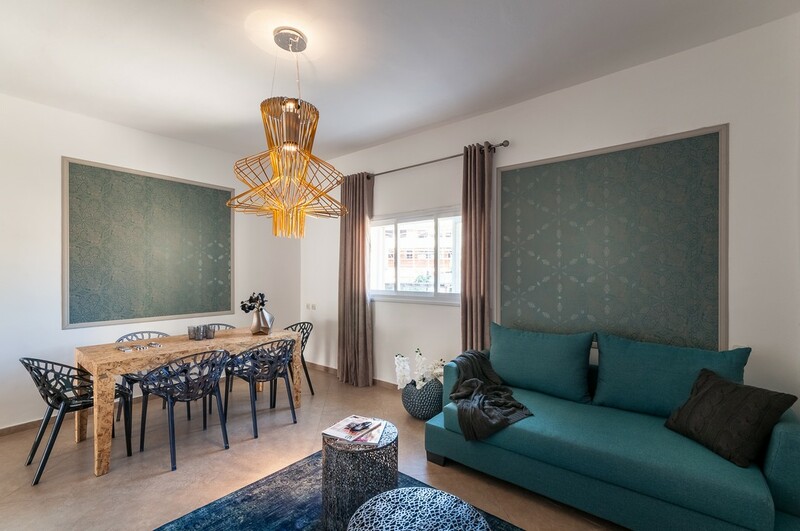 [BARTENURA] : In the tranquil, charming Rechavia neighborhood of Jerusalem, the 2-bedroom Bartenura vacation apartment puts you just a short walk away from the city center without sacrificing peace and quiet. Tour the ancient Jaffa Gate and the historical sites of the Old City (20 min. walk) or check out the gorgeous hiking trails and ruins of Sacher Park (15 min). The world-famous Israel Museum is a 15-minute bus ride away, and the chic restaurants and bars of Azza Street are right on your doorstep. Bus stops are right outside the apartment. Our local designers have created a funky, colorful interior with comfy furniture and tribal accents. Picture windows fill the living room with sunlight, and the state-of-the-art kitchen will keep everyone fed in style. A quaint balcony is the perfect place to sit and enjoy the evening air. Premium amenities include a Nespresso machine, free WiFi, cable TV, hotel beds and linens, and high-end toiletries. [KING DAVID II] : Spacieux et central, l'appartement King David II de 3 chambres dans le quartier de Mamilla à Jérusalem sera votre base à Jérusalem. La rue ci-dessous mène à des vues digne de cartes postales aux deux extrémités: d'un côté, vous verrez les murs de la vieille ville, de l'autre le moulin à vent et les jardins historiques de Montefiore. Les anciennes merveilles de la vieille ville ne sont qu'à quelques minutes à pied (10 min). Pour une expérience emblématique de Jérusalem, marchez 20 minutes jusqu'au marché en plein air de Machane Yehuda. Des bus et un arrêt de tramway sont juste au coin de la rue. Nos designers d'intérieur locaux ont créé un espace élégant et moderne pour votre séjour. Vous allez adorer la grande cuisine en marbre, le balcon ensoleillé et les chambres somptueuses. Les équipements haut de gamme comprennent une connexion Wi-Fi gratuite, une télévision par câble, des articles de toilette haut de gamme, des lits et des draps, ainsi qu'une machine à café Nespresso. Idéal pour les familles ou les retraites de groupe, cet appartement vous met en plein coeur de la ville. 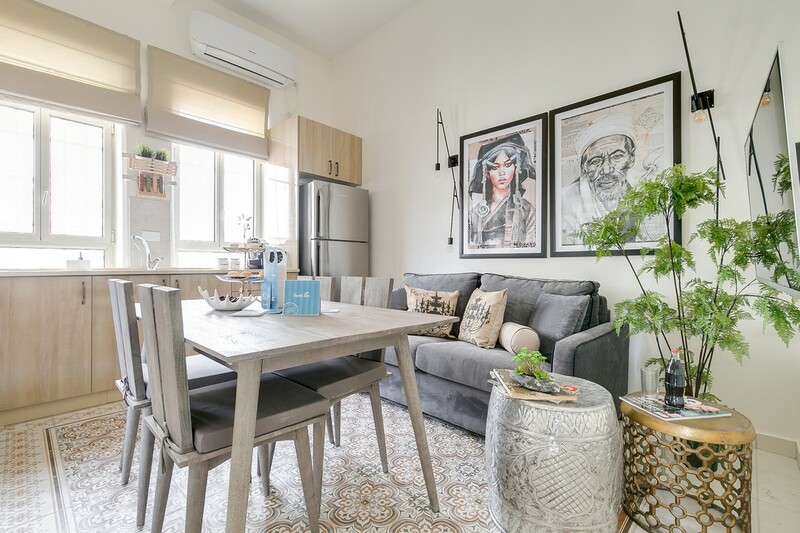 [AGAN II] : Located on a quiet alleyway in Jerusalem’s lively City Center, the funky 2-bedroom Agan II apartment puts you in the heart of the city. It’s easy to walk to many of the city’s most famous attractions, including the Old City (20 min), Mamilla Avenue (15 min) and the Mahane Yehuda Market (10 min). Bus and light rail stops are just down the street (3 min). This vacation apartment has been planned by our local designer for a laid-back Middle Eastern vibe. You’ll love the sunlit living room, plush bedrooms, and fully equipped kitchen. The view from the apartment’s private balcony is a highlight, with patio chairs placed to watch a beautiful sunset. Premium amenities include a Nespresso machine, free WiFi, cable TV, high-end toiletries, and hotel beds and linens. 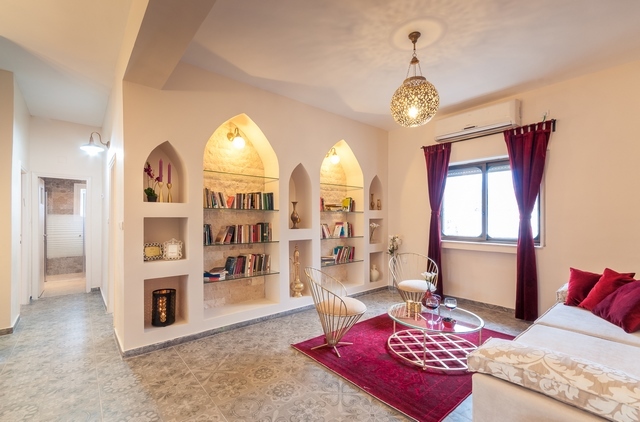 With all of Jerusalem’s colorful sites only minutes away, this apartment is perfect for a family or group of friends. [KDR 207] : Fabulous and VERY well kept spacious 3 bedroom, 2 bathrooms on 4th floor with balcony facing King david street and great views! Fully furnished and equipped, Lovely design and very comfortable ! 7 guests ! 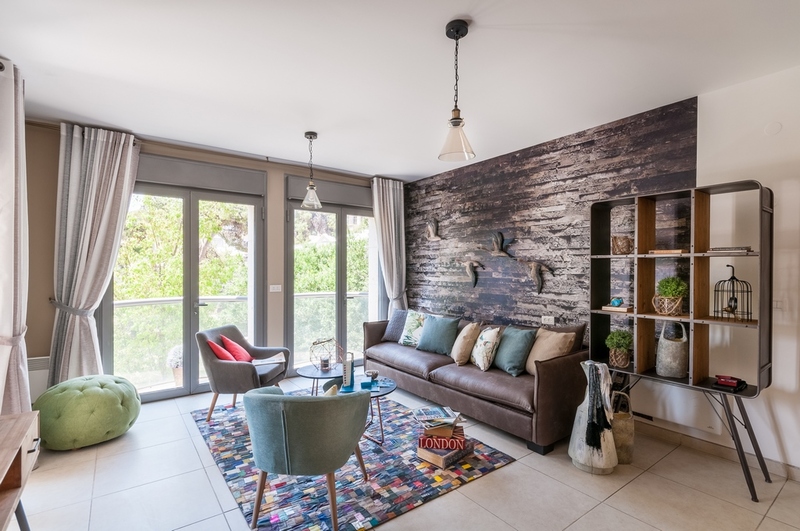 [Ben-Maimon RECHAVIA] : In Jerusalem’s tranquil Rechavia neighborhood, the 2-bedroom Ben Maimon vacation apartment will be your holiday hideaway. Funky cafes and hipster bars dot the streets, and you’ll see lots of locals going about their day. Don’t miss the famous open-air Mahane Yehuda Market (15 min. walk) or the historic restaurants and shops of Mamilla Boulevard (16 min). The ancient Old City of Jerusalem is only an 8-minute drive or 20-minute walk away. Local buses will take you all around the city with ease. 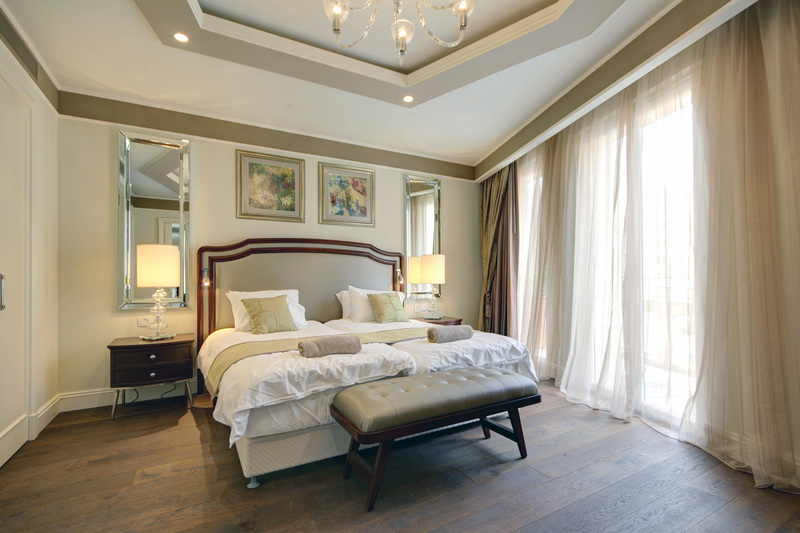 Our local interior designer has created a two-bedroom "palace" that will make you feel like royalty. Jerusalem stone walls, draping curtains, and tiled floors will transport you to another world. The fully equipped kitchen, two plush bedrooms, and sunny balcony give you all the comforts of home. Premium amenities include a Nespresso machine, free WiFi, hotel beds and linens, high-end toiletries, and cable TV. Honesty is the best policy: there is no elevator in this apartment, but the staircase is awfully nice! Ideal for families and groups of travelers, this apartment will rejuvenate you at the end of each exciting day. 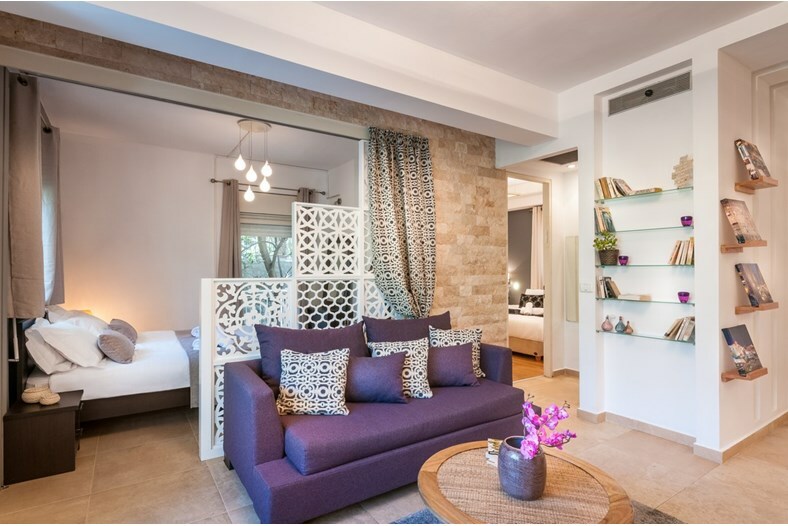 [HaRav Kook II] : Located in the City Center of Jerusalem, and only a 20-minute walk from Jerusalem’s Old City, with its many iconic, religious, and historical sites, the 3-bedroom Harav Kook II vacation apartment is a wonderful place to relax and revive. A mere 12-minutes from the ever-bustling Machane Yehuda Market, cafes and restaurants are right on your doorstep, with bus and light rail stops providing you with easy access to the rest of Jerusalem. Our local interior designer has decorated this sophisticated space with elegant antiques and fiery red accents. Sip a glass of boutique wine on your cozy, furnished balcony. Curl up with loved ones on your couch. Tired from a long day of touring? Seek solace in plush Egyptian cotton bedding that will ensure you get a good night of sleep. Premium amenities include free Wi-Fi, cable TV, high-end toiletries, and a Nespresso machine. 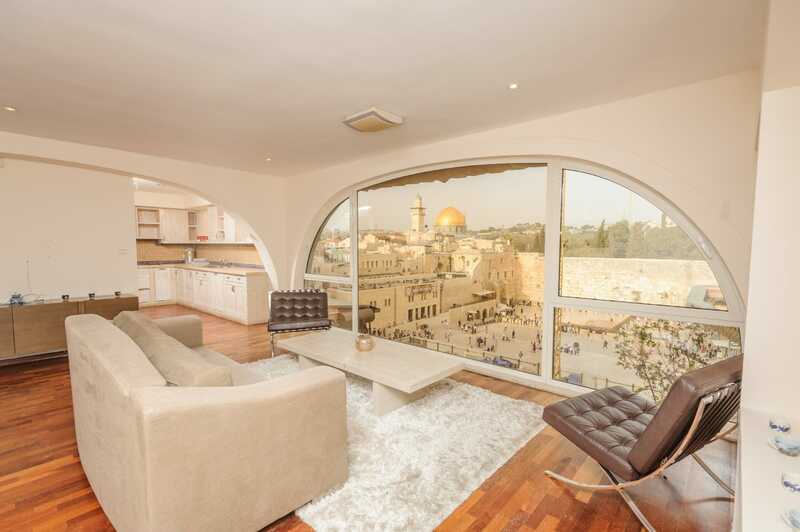 [Western Wall apartment] : The Western Wall apartment offers accommodation in Jerusalem, 100 metres from Western Wall and a 4-minute walk from Dome of the Rock. The air-conditioned accommodation is 700 metres from Church of All Nations. The apartment features a kitchen with a dining area and an oven, a bathroom, and a washing machine. Garden of Gethsemane is 900 metres from The Western Wall apartment. The nearest airport is Ben Gurion Airport, 42 km from the property. 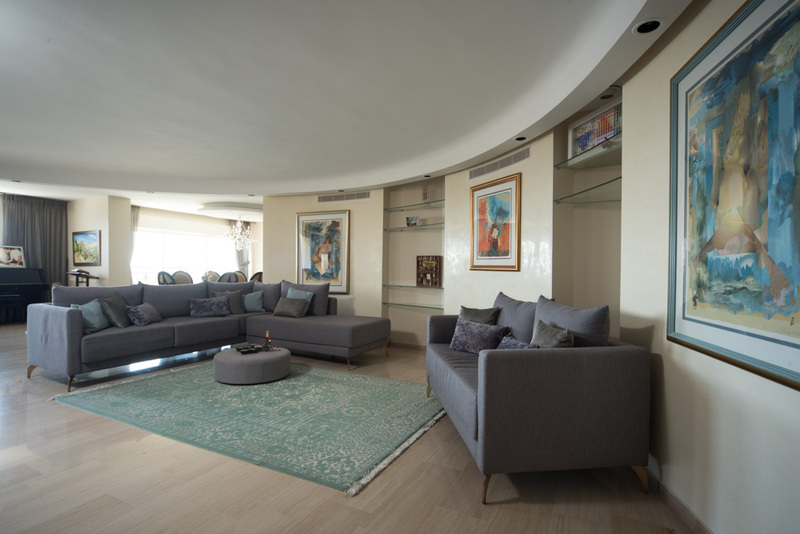 [HaRav Kook Penthouse] : Located in Jerusalem’s culturally diverse City Center, a 20-minute walk from Jerusalem’s Old City, with its many iconic, religious, and historical sites, the 3-bedroom Harav Kook Penthouse is an absolute gem of a vacation apartment. A 6-minute stroll from the enchanting neighborhood of Nachalat Shiva, with its inviting nooks and crannies, and a mere 5-minute walk from the melodious Music Square, this magnificent crown jewel places cafés and restaurants right on your doorstep, with bus and light rail stops providing you with easy access to the rest of the holy city. Our local interior designer and Jerusalem native has decorated this sophisticated space with chic, modish accents. Sip a glass of boutique wine on your cozy, furnished balcony. Curl up with loved ones on your comfy couch. Exhausted from a seemingly never-ending day of sightseeing? Seek solace in plush Egyptian cotton, bedding that will ensure you get a good night of sleep. Quite truly the epitome of luxury, the Penthouse also features a fashionable fitness center, located onsite for guests to break a sweat at their convenience. Premium amenities include free Wi-Fi, cable TV, high-end toiletries, and a Nespresso machine. Perfect for couples or small groups of friends, this stunning space in the heart of the city has it all. Please be advised that according to the law, any guest not entering the country with a tourist permit will be obligated to pay 17% VAT. Superb amazing & spacious 6-10 guests vacation rental in the BEST LOCATION IN TOWN ! The apartment is situated in the new Mamilla complex - right above the mamilla mall and across the street from the David citadel hotel! Stylished and designed to the highest standard and comfort! Pay less than one hotel room and sleep between 6-10 persons. 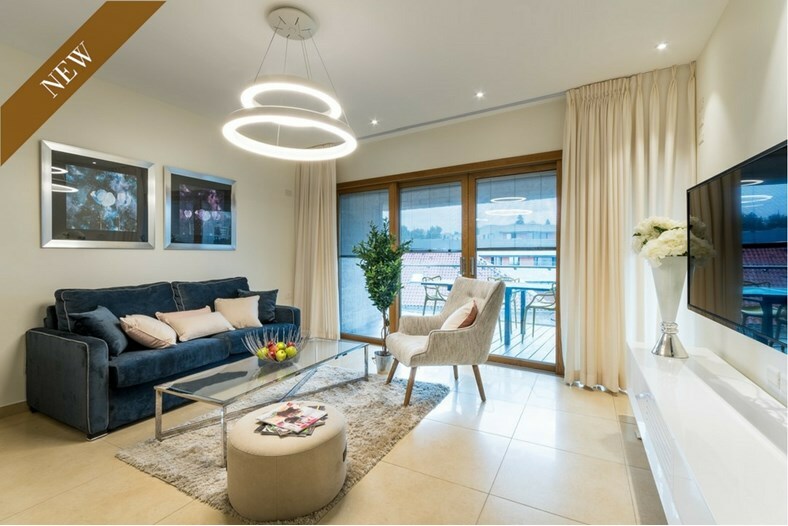 [Luxury Penthouse Diskin] : Spacious, opulent, and overlooking the beautiful Sacher Park, the 5 bedroom Luxury Diskin vacation apartment is the perfect base for a Jerusalem holiday. In a prime location in the quiet Shaarei Chesed neighborhood, both the City Center and the bustling Mahane Yehuda Market are just a 15 minute walk. Pass through Independence Park as you journey to explore the ancient history of the Old City (25 min walk). Shop the boutiques in the Mamilla Mall (18 min) or browse the many art galleries on King David Street (16 min). Bus stops are just 2 minutes away. 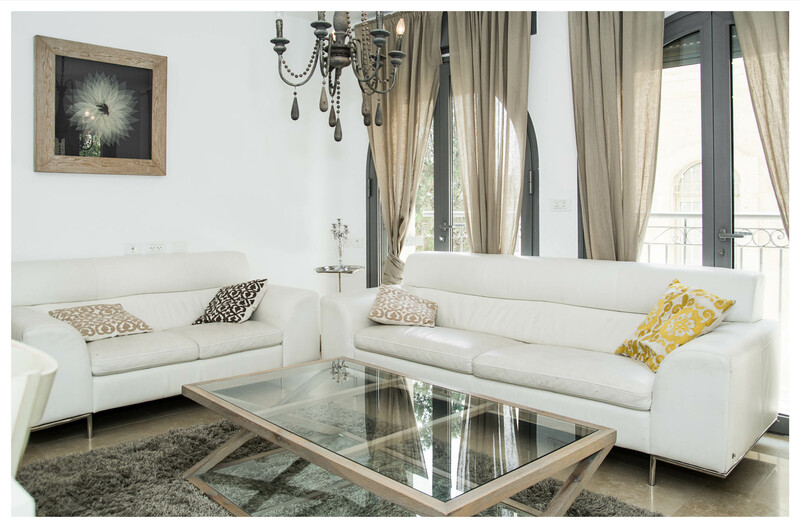 Our local interior designer has created an upscale, modern space for your visit to Jerusalem. The large, open plan living room, chic coffee table, and sleek glass dining table ensure plenty of room for up to 10 guests. Enjoy a comfortable night in with the fully equipped island kitchen. Plush bedrooms full of natural light will ensure a restful vacation for everyone. Premium amenities include free WiFi, cable TV, high-end toiletries, hotel beds and linens, and a Nespresso machine. Ideal for families or large groups of friends, this apartment will ensure a smooth, peaceful holiday. 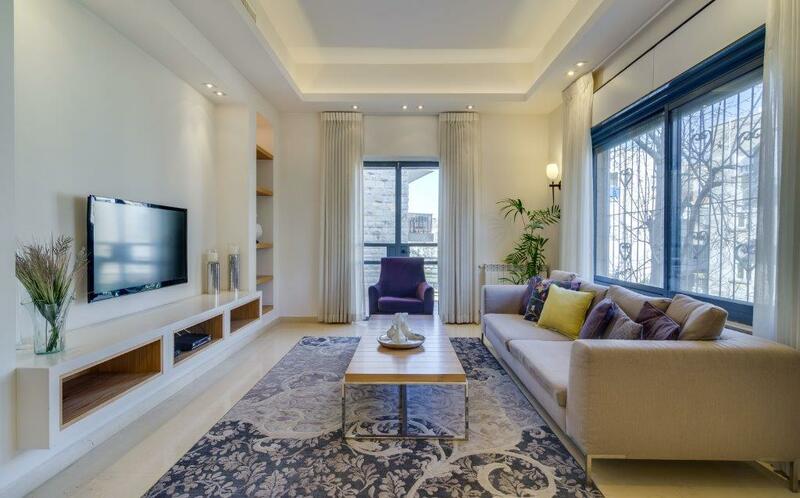 [King David Residence 5 Bed] : In Jerusalem’s elegant Mamilla neighborhood, the spacious 5-bedroom King David vacation apartment combines a prime location with all the comforts of home. 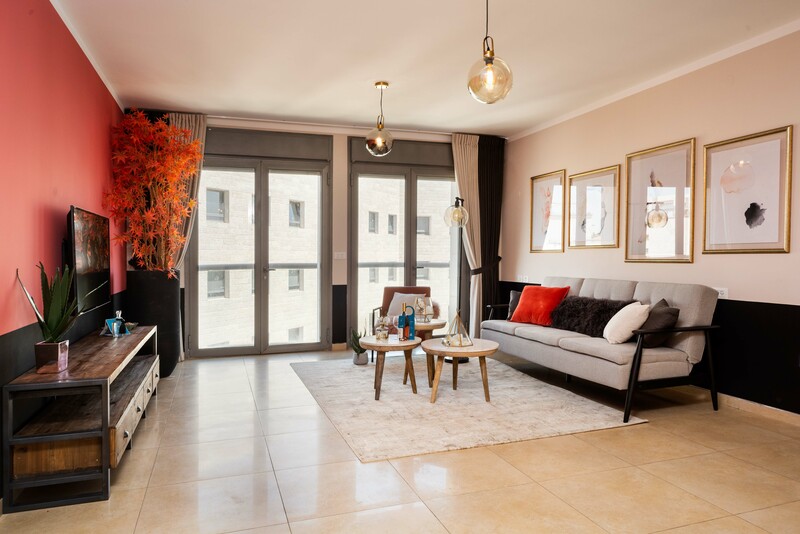 This apartment, located in the exclusive King David Residence building, is just a 9-minute stroll from the many famous sights of the Old City. Right outside your door is the upscale Mamilla Mall, a beautiful pedestrian street filled with boutiques and restaurants. Buses and a light rail station are just outside. With large rooms and a beautiful, relaxing color palette, our local interior designers have created a space that will make you feel immediately at home. 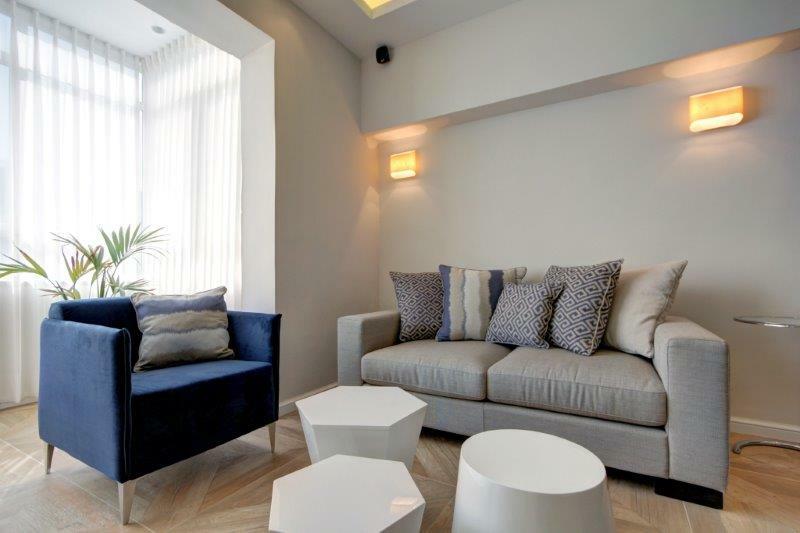 Each piece of furniture and splash of decor has been carefully chosen to create a pristinely elegant atmosphere. A furnished balcony overlooks the fashionable pedestrian mall. 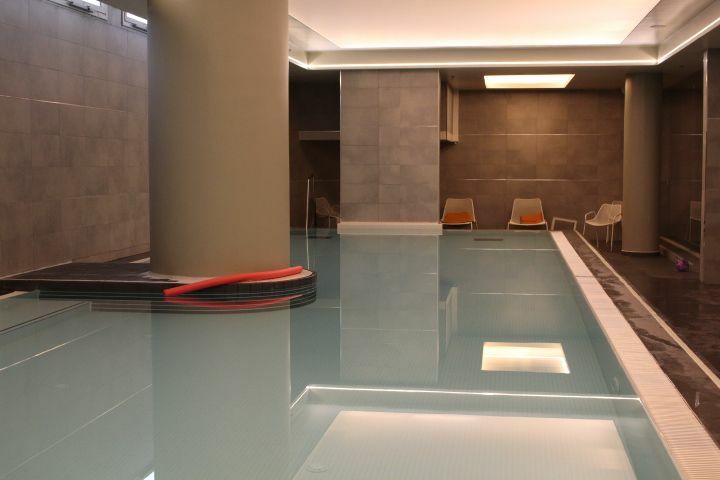 Guests can take advantage of the facilities in the building, including an indoor swimming pool and gym. Premium amenities include free WiFi, cable TV, high-end toiletries, hotel beds and linens, and a Nespresso machine. 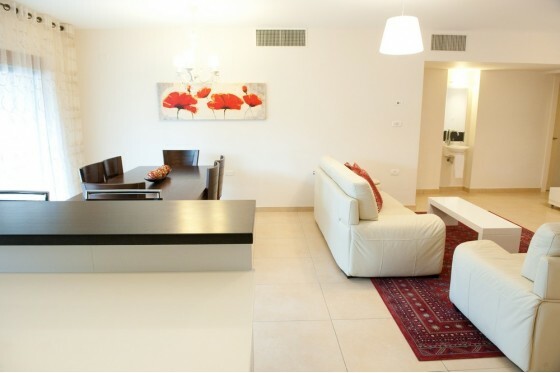 Perfect for families or large groups, this gorgeous vacation apartment will make your stay in Jerusalem unforgettable. 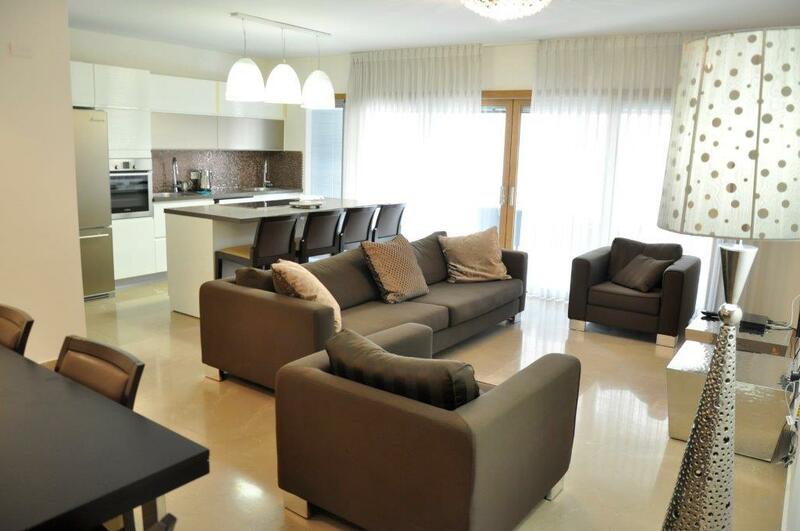 Located just above the new focal point of Jerusalem - the Mamilla Mall - this stunning 2 bedroom apartment has it all. In the best possible location just above and adjacent to the fantastic pedestrian mall, a 5 minute walk to the Old City (Jaffa Gate) and less than 10 minutes from the heart of town. Only 10-12 minutes to the Kotel. Situated between the David's Citadel, Waldorf Astoria and Mamilla Hotels. Lots of shopping, cafe's and many kosher restaurants are just steps away. 2 flat panel TV's with great cable, Wi-Fi, fully equipped Kosher kitchen and indoor parking spot. Sunny, bright, shiny and luxurious with modern,sophisticated Italian furnishings. 2 large bathrooms and 1 powder room, washer / dryer, excellent security. Excellent ventilation,air conditioning and heating. Shabbat clock and all other amenities for Shabbat / Chagim. Staying here is truly a first class experience. Comparable to one of the nicest suites in any of the adjacent 5 star hotels and at a fraction of the cost. Worried about missing those great hotel breakfasts? Enjoy beautiful breakfasts (and other meals) at one of the many cafes and eateries in the Mall just steps away - while at the same time feeling even more a part of life in Jerusalem. Our management ensures that the apartment will be meticulously prepared and ready for your arrival and will do everything possible to ensure that your stay is enjoyable and hassle free. Nice building, 2 mns from mamilla. Building with security , gym and pool in building . Great views to the old city! [MAMILLA PENTHOUSE] : It is a last floor penthouse (2nd floor). [NEW Penthouse Harav kook] : ALL NEW FURNITURE !! BEST LOCATION! AMAZING VIEW! with 24/7 security and reception and with gym! high standard living space luxury furnished for your vacation. 3 rd floor with elevator straight to apartment. New secured building witg private parking . 5 bedrooms plus den with option to close to a bedrooms. All what you need for a dream vacation in Jerusalem! parking elevator and 24/7 security and reception. 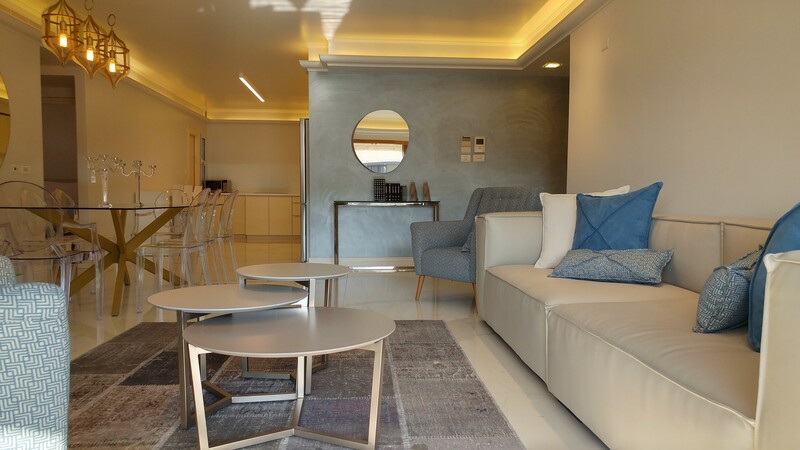 [DAVID CITADEL RESIDENCES] : This beautiful, spacious apartment is located in the exclusive David Citadel Residences, adjacent to the David Citadel Hotel. There are 4 bedrooms and 2 bathrooms and a huge porch with beautiful views. There is one very spacious master bedroom in a separate wing of the apartment with a luxurious jacuzzi tub and a walk in closet. There are two other bedrooms that have two beds in each, and the 4th bedroom is narrower and has one bed in it. The apartment can sleep a total of 7 people as is, and we can always supply an additional folding bed if necessary.